The gospel in Ravenna, in Aurora and Stowe, Franklin and Hudson. THE CHURCH OF CHRIST IN RAVENNA. THIS is one of the most stable of the churches. From its establishment, early in May, 1830, to the present time, a period of over forty-five years, it has never once ceased to meet on the blessed Lord's day, except as they agreed to omit in favor of the regular yearly meeting. The conversion and baptism of Ebenezer Williams, the Restorationist minister, living in Ravenna, by Aylett Raines, has already been mentioned. From this event the work opened, as Bro. Williams immediately began to preach the gospel which he now understood, and most ardently loved. His preaching being mostly abroad, no stand was taken for the apostolic gospel in Ravenna. In the winter of 1830 Marcus Bosworth sent an appointment to the Clement district, three miles north-west of the town of Ravenna. His audience was small, but it yielded the fruit of one conversion, a brother Jonathan Stewart. The 12th of March, William Hayden came. Seven souls turned to the Lord. From this time the tide of interest swelled. The subject of the new preaching was in every one's mouth. No lack of hearers now, and there were converts at every appointment. The seeds of a pernicious infidelity had been early sown in Ravenna. They were bearing their bitter and baleful fruits in a reckless indifference to all sacred things, and the revolt of the soul from all religious obligations. Hayden was the man for such a people. Well prepared on the evidences of the Bible, and very expert in exposing the subtle and sophistical refuges of the unbelieving heart, his sermons were heard with great satisfaction and profit. Early in May, he collected the disciples together, numbering twenty-six, and formally set them apart as a church of Jesus Christ. Bro. Sturdevant, a licensed preacher of the Baptist order, uniting, the new church was placed under his charge. It continued to prosper, gathering additions almost every time a preacher came in among them. Bros. Ryder, Atwater, Green, and the Deerfield brethren came, like Apollos and Timothy, to comfort their hearts and confirm their faith; but Hayden and Bosworth were their chief reliance. In the absence of a preacher, the members assumed the duties of edification, and broke the loaf of blessing among themselves; a practice in which the disciples on the Western Reserve were correctly taught in the beginning. In the summer of 1830, Scott delivered a discourse in the Methodist church, in the village, to a full and delighted audience. Fisher, of Kentucky, was with him. It was here he compared the creed to a silver quarter-dollar, which, though small, may be held so close to the eye that the sun can not be seen: Thus the creed, though a little thing, may hide the Bible from sight. the emissaries of that crude and strange delusion were every-where active in calling victims into the snare. On his way he made Ravenna a point for a few addresses. William Hayden, with whom he had communicated in regard to his trip, obtained, with the assistance of the brethren, and fitted up with seats a grove in the environs of the town. A vast crowd of people came to hear the gifted advocate and defender of the Bible. The bold and prattling infidelity, rampant in Ravenna, found no quarter at his hands. Like a pestiferous atmosphere, it was poisoning and demoralizing all piety, all truth, all moral health, and was destructive to all social order and happiness. Mr. Campbell was at home in this department of Christian labor. He surveyed his audience, and directing well the range of his artillery, within two hours and a half the flotilla of their skeptical crafts was shattered and sunken. "Heavens! what an eye he has!" said one of the master men to F. Williams; "he scorches wherever he looks!" Nor to defend his cause! publishing, in Ravenna, a little paper, the "Ohio Watchman," an infidel sheet of some pretensions. The editor was in the assembly. In the sermon, Mr. Campbell, having made a climax in his argument, paused on it, remarking: "He who can not see this, has closed his ears and shut his eyes, and is blind--as blind" -- gathering force by delay, "as blind as the 'Ohio Watchman!'" At the dinner table, at the hotel, where the judge and several of the lawyers were dining, the argument of Mr. Campbell was the topic of conversation. One of the young lawyers remarked: "I could not see the point of Mr. Campbell's argument to-day!" "Very likely," replied the judge; "arguments are always obscure to persons who can not understand them!" Frederick Williams, long a prominent citizen of the county, an elder and useful preacher, was born in Hampshire County, Mass., March 2, 1799. He came to Ravenna, July 2, 1815. On the 17th of September, 1828, he married Miss Marcia Underwood, an alliance of uninterrupted happiness to the present time. His mind had been imbued with Winchesterian Universalism, but on hearing the gospel as proclaimed by the apostles, his candid heart laid hold of it. In the year 1833, he and his wife were baptized in Sandy Lake by Amos Allerton. public discourse to maintain the church for a whole generation. Few churches have been blessed with so judicious and efficient elders. Bro. Judd, full of honor and of hope, went to await his crown, November 17, 1864, and was laid beside his foster son, the beloved and lamented Sterling McBride. Bro. Williams tarries yet a little longer. The Congregation continued to meet in the Clemment district about ten years, when they moved into the village. They built their house in 1844. Bro. A. B. Green conducted the dedicatory exercises in December, from which time they have not only held the ground but gained in numbers, wisdom, and social power. Bro. John T. Smith was employed, Bro. Charles McDougal also. Bro. C. C. Foot served four years. He was followed by Bro. A. B. Green -- five years. Bro. Lowe and Bro. Amzi Atwater came afterward. The congregation now flourishes under the administration of Bro. George Darsie. The first yearly meeting held in Ravenna was in June, 1838. It was held in a large barn fitted up for the purpose. The preachers in attendance were Hubbard, Marcus Bosworth, William Hayden; Moss, Allerton, J. W. Lanphear, A. B. Green, Robison, Moody, A. P. Jones and A. S. Hayden. Ravenna church has always hospitably entertained the brethren, and numerous conventions have, from time to time, found there a welcome. Present overseers: George Darsie, Albert Underwood, Samuel J. Gross. Deacons: John Mahard, R. B. Johnson, Whiting Carter, P. P. Dawley, E. C. Belding, Alex. Clements. Members: 319.
also, as he was one of the most diligent members of this association. "Resolved, That we have a deep sense of the loss sustained by his afflicted wife and children, in the early demise of her devoted husband and their affectionate father. F. H. HAWLEY, } Com. they committed the management of their affairs. For four years the church met in the south school-house, by Eli Cannon's; after this they moved the meetings to the center of the township. Bro. Marcus Bosworth was early on the ground. Happy the people who heard the weeping Bosworth. He was brimful of tenderness. "Little children, let us love one another, for love is of God;" came as naturally from him as from the lips of the beloved disciple. He and Hayden were greatly attached, and they were counterpointed in a most admirable manner to be co-workers in the gospel. Soon after the church got under way the serene and stately Bentley came among them, adding the weight of piety, experience, and great personal dignity, elements both needful and rare, to enforce and carry on the work of reform. The following were the original members: Isaac H. Streator and his wife Clarina Streator; their children Charity, Cyrus and Marius Streator; Alonzo Root and his wife; Whitney Smith and his wife; Simon and Sally Norton; Polly Ruggles, Mary Lake, Gamaliel H. Kent and his wife; Russell G. McCarty and his wife; Samuel Russell, Joel Giles, and Sophronia Stanton. In a short time, both Henry and Alanson Baldwin, with their wives, came in. For many years they were leading men, and their bountiful hospitality was an efficient means of sustaining the cause. Bro. Henry Baldwin, for many years one of the overseers, moved twenty years ago to Niles, where he fell peacefully asleep June, 1875, aged 82 years. "The woods were full of horses and carriages, and the hundreds already there were rapidly swelled to many thousands; all of one race--the Yankee; all of one calling, or nearly--the farmer; hardy, shrewd, sunburned, cool, thoughtful and intelligent. The disciples were, from the first, emancipated from the Puritan slavery of the Sabbath; and, although grave, thoughtful and serious, as they were on this Sunday morning, it was from the gravity and seriousness of the occasion, and little from the day itself--an assemblage that Paul would have been glad to preach to. "At the hour of eleven., Mr. Campbell and his party took their places on the stand, and after a short, simple, preliminary service, conducted by another, he came forward to the front. He was then about forty years old, above the average height, of singular dignity of form, and simple grace of manner. His was a splendid head, borne well back, with a bold, strong forehead, from which his fine hair was turned back; a strong, full, expressive eye, aquiline nose, fine mouth, and prominent chin. He was a perfect master of himself, a perfect master of his theme, and, from the moment he stood in its presence, a perfect master of his immense audience. "At a glance he took the measure and level of the average mind before him -- a Scotchman's estimate of the Yankee -- and began at that level; and as he rose from it, he took the assembled host with him. In nothing was he like Rigdon; calm, clear, strong, logical, yet perfectly simple. Men felt themselves lifted and carried, and wondered at the ease and apparent want of effort with which it was done. "Nothing could be more transparent than his statement of his subject; nothing franker than his admission of its difficulties; nothing more direct than his enumeration of the means he must employ, and the conclusions he must reach. With great intellectual resources, and great acquisitions, athlete and gladiator as he was, he was a logician by instinct and habit of mind, and took a pleasure in magnifying, to their utmost, the difficulties of his positions, so that when the latter were finally maintained, the mind was satisfied with the result. His language was copious, his style nervous, and the characteristic of his mind was direct, manly, sustained vigor; and under its play he evolved a warmth which kindled to the fervor of sustained eloquence, and which, in the judgment of many, is the only true eloquence. After nearly two hours, his natural and logical conclusion was the old pentecostal mandate of Simon Peter, and a strong, manly and tender call of men to obedience. There was no appeal to passion, no effort at pathos, no figures or rhetoric, but a warm, kindling, heated, glowing, manly argument, silencing the will, captivating the judgment, and satisfying the reason; and the cold, shrewd, thinking, calculating Yankee liked it. it to hesitate no longer. When he closed, low murmurs broke and ran through the awed crowd; men and women from all parts of the vast assemblage, with streaming eyes, came forward; young men who had climbed into the small trees from curiosity, came down from conviction, and went forward to baptism; and the brothers and sisters set up a glad hymn, sang with tremulous voices, clasping hands amid happy tears. "Thus, in that far off time, in the maple woods, under the June sun, the gospel was preached and received." For the next three years there was a steady increase. In June, 1834, the yearly meeting was in Aurora. It was one of much historic importance; a large number of preachers attended it, many of whom, before this, were nearly strangers. Hymns and tunes, known by leaders, were caught and transfused throughout the mass of eager disciples, and carried home to animate the rising churches every-where. Chauncey Forward, from Somerset, Pa., was present as the chief speaker. Aurora was his home in his youth. He had attained a distinguished position at the bar and in Congress; but having confessed the Lord Jesus, he renounced the professions of law and the rulership of men, and he appeared on this occasion among the scenes of early years; to plead the cause of primitive Christianity. His abilities as a reasoner and eloquence in appeal, commanded the profound attention of large audiences daily. There were thirty-one converts, some of whom afterward became public advocates of the gospel. Green held a meeting in it, with thirty conversions. In 1855 it was burned. A better one was immediately erected at a cost of $1500, and dedicated by A. S. Hayden. In 1843, a great meeting was conducted by Bros. J. H. Jones and John Henry, which brought in thirty additions. The same year, M. L. Wilcox came and preached for two years with great acceptance. There were churches formed in Streetsborough and in Bainbridge in the year 1845, which drew members from this church and reduced its strength. These societies, after flourishing a number of years, have both become extinct; but the parent church, though weakened, has never failed to keep the light burning. "From first to last the church has had as teachers, William Hayden, M. Bosworth, A. S. Hayden, A. Bentley, J. J. Moss, John Henry, Charles McDougall, J. T. Smith, T. Munnell, J. Hartzel, A. Allerton, A. B. Green, W. Collins, B. F. Perky, M. L. Wilcox, N. Dunshee, T. J. Newcomb, H. W. Everest, J. A. Garfield, C. P. Bowler, E. Doolittle, S. A. Griffin, B. A. Hinsdale, O. C. Hill, and some others." But to the home membership all credit is due for faithfulness and devotion to the cause in all times and amidst many trying discouragements. was to be done? They could scarcely believe their own eyes. His testament was then examined. It was found to contain the imprint of the "American Bible Society!" They saw the "situation"--their ignorance of their own Bible and its plain teaching. He relished their confusion, but was generous enough to listen to their earnest and repeated charges to "tell nobody!" But it told itself. They came out to hear, and all of them obeyed the gospel, despite protests, vows, and cautions, choosing nobly and rightly to obey God rather than man. Another incident is related of a woman of good sense and intelligence, who came to Aurora from the State of New York to visit her relatives. She was at once told of the new heresy--that they took the people, and if they just said they believed, they baptized them without any change of heart, and then they were sure of heaven. This woman, in deep astonishment, said: "Surely they get no persons of intelligence or respectability to follow them?" "O, yes, some of the best and most substantial people in town are among their converts." She replied, "There is certainly something wrong about this; for no person of common sense can believe such things as you tell me they preach: I must hear them myself." She went, heard, saw the truth, obeyed it, and returned home rejoicing in the new light of gospel truth which shone upon her heart. RISE OF THE CONGREGATION IN STOWE. For O, the wolf is nigh!" No one doubted to whom he meant to apply the term wolf. But like the terms orthodoxy and heterodoxy, its meaning depends much on who uses it. The shrill-voiced singers in the audience, looking up to the large, dark form of the preacher, sang "wolf" as well as he. Henry, in reporting it, said they all sung "wolf," "wolf," but himself; and he neither sung wolf nor howled! The sermon which followed was a perversion of the views of the disciples. But ample correction followed, and the cause of reform gained by the opportunity. forcing its advancement through intense opposition Students, and occasionally a professor, from, Hudson college, only a few miles distant, practiced their skill in attempted refutation of an imaginary novelty which they styled "Campbellism." The converts, however, were too well grounded in the Scriptures to be alarmed by these misdirected assaults. If the school-houses were closed, private houses were opened. The Darrows, the Sawyers, the Starks, the Stowes, the Thomases, the Lindsays, and the Gaylords received the truth in the love of it, and soon united to sustain meetings on the Lord's day. In June, 1834, Timothy Wallace obeyed the gospel in Aurora, at the yearly meeting. These principles were making progress at the same time, and by the same agencies, in Franklin, and in Hudson township. In the north-west part of Hudson, Williams and Hayden were successful in teaching the people the difference between the church of Christ founded on the New Covenant, and all ecclesiastical organizations established on human foundations. Zina Post and his family, with his son-in-law, Bro. A. E. Foote, "hearing, believed and were baptized;" Sherman Oviatt also, and others, in such numbers that they founded a church there which continued many years. In Franklin the Converses, the Wadsworths, the Clapps, and the Burts were the beginning of the congregation known afterwards as the church in Kent. Bro. D. S. Burnett, of Cincinnati, has plead here, with his great abilities, the claims of the Lord Jesus. Over the most of this region the sentiments of Universalism prevailed. With these the principles of the gospel came in sharp collision; constantly in private, and several times in public, there were discussions on the subject. A debate of several days was held in Franklin between A. B. Green and Rev. Davis, which opened the eyes of many to the dangers of the slippery rock on which they were standing, and led them to Christ. After several years, the church in Stowe suspended meetings as the result of removal and other causes. But the remaining members kept the fire burning, and a reorganization of the church was made January 9th, 1844. It was effected during a meeting held by Charles F. Bartlett, J. P. Robison and A. S. Hayden. The members then, were David Darrow, Zebulun Stowe, Eli Gaylord, B. Stark, C. Thomas, J. C. Willis, Datus E. Lendsay and Constant Rogers, with their wives, and Miss C. Stark--sixteen members. In April, 1873, twenty-nine years after, it had one hundred and twenty members. This church has long been a light to the county. With lavish hospitality the members have repeatedly welcomed the great Tent meetings, and have been richly repaid in the fruits of edification and conversion. Among its honorable and most useful names now gone to rest, should be mentioned David Darrow, Zebulun Stowe and Edwin Wetmore, faithful leaders, who long, zealously, and cheerfully gave a powerful support to the cause. These, with the names of many others, are cherished in grateful hearts. As resident preachers, they have had W. T. Horner, S. R. Willard, A. C. Bartlett, H. J. White; while scarcely any of the preachers known in north-eastern Ohio can be named who have not aided them in meetings. This church is the religious birth-home of L. Southmayd and J. C. Stark, brethren who have done, and are still doing, effective service as preachers of the gospel. Her present elders are U. Marvin, A. S. Wheeler, and William Southmayd. Deacons, A. C. Stowe, J. R. Ream, and L. Hartle. They have sustained a lively Sunday-school for twenty years, and have a valuable church property with a parsonage. Origin of the Church in Bedford -- Yearly Meetings -- Sermon by A. Campbell -- Bartlett -- Robison -- Jones -- Prominent Preachers -- The Gospel in Newburg -- Great Yearly Meeting -- Quarterly Meeting -- Incidents. THE congregation in Bedford arose in the following manner: E. Williams came in May, 1830, and preached the way of salvation, where formerly he had taught Restorationism. Newell C. Barnum was the first convert. He came monthly during the summer; and in June, Enoch Allen and some others were baptized. In July, Mrs. William Williams, of Newburg, Livonia Payne, "Grandmother Barnum," Julia Barnum, and Laura Gould came in. In the fall, Wm. Hayden held a meeting and baptized eight, and from this time he held the ground. In November, 1832, he held a meeting with Bro. Moss, and in the following month he formed the church with twenty members. Thomas Marble was chosen the overseer, and Enoch Allen and Geo. M. Payne, deacons. Bro. Green, on his first tour of preaching, came in September, 1833. The next year Moss became a resident of Bedford,, and for five years he assembled with them and taught many. chosen to serve as the bishops, and Enoch Allen, Alanson Gray, George Comstock, and Charles F. Bartlett, who was baptized the month before, came in as deacons. In July, 1840, James Young and Sidney Smith were re-appointed elders, together with C. F. Bartlett and R. S. Benedict, while the ever-faithful Enoch Allen continued to serve the church as a deacon, his co-deacons being now S. F. Lockwood, Augustine Collins, and S. A. Hathaway. The congregation had now become numerous, and in her board of rulers were men of much solidity and judgment. The year 1837 was one of marked prosperity for the church. In August, James Young and his wife united, also Dr. J. P. Robison, Sidney Smith, and others, whose position gave weight to their influence. In November, Chas. F. Bartlett and John S. Young came to Christ. Two of these, Robison and Bartlett, arose to extensive usefulness as proclaimers of the gospel. About thirty souls united between August and December. The church, thus lifted up to great strength, and filled with a zeal "according to knowledge," added constantly to her numbers, seldom a week passing without accessions. laid aside the name and terms of party in favor of the union of Christians in the new covenant. This enterprising church opened a "door of faith" in school-houses and private dwellings, in all available places, and by unremitting appeals the community became thoroughly leavened. The yearly meeting for Cuyahoga County was held with the church in Bedford, in the year 1839, its first assembling in that town. It was held on the Lord's day beside the meeting-house which was erected by the generosity of Sister Willis, a house intended for the use of the Baptists, but which, with her change of views, became the property of the Disciples. This house was filled on Friday the first day of the meeting. After a discourse by Bro. J. Hartzel, and an exhortation by Bro. M. Bosworth, Bro. Campbell followed with a eulogium of much power, beauty, and eloquence on the Holy Scriptures. of infidelity in the city of Cleveland, in June, 1836, gave him a reputation all along this region of the lakes, as the first and ablest of living orators. His discourse on Saturday was from Jer. vi: 16: "Thus saith the Lord, Stand ye in the ways, and see, and ask for the old paths, where is the good way, and walk therein, and ye shall find rest for your souls. But they said, We will not walk therein." This subject was taken at the instance of Cyrus Bosworth, and grandly did he plead that day for a return to "the good old way" of the Savior and his apostles. On Lord's day he held the great audience of five thousand in fixed attention for two and a half hours by the watch, in a discussion of the atonement, a theme offering little attraction to a popular assembly. Yet he made this difficult subject so luminous with his rich stores of biblical learning, that time passed unconsciously to his listening auditors, very many of whom, for want of seats, stood the whole time of the sermon. To the suffering Savior; and discussed all these bearings of the subject in the clear light of the teachings of the Holy Spirit. The effect of this sermon was immediate and salutary. It presented this vital theme in a breadth and comprehension in which few, perhaps none, had been accustomed to view it; it asserted clearly and convincingly the death of Christ as a sacrifice, essential to the salvation of sinners; it vindicated the Holy Scriptures in their teaching on that subject, so often objected to by skeptics; it delivered the minds of his hearers from limited views, and opened to them the richness and extent of the subject to which they were not accustomed, and greatly exalted Christ and his salvation in the conceptions of the people. It set the pleadings for reformation on a new and solid basis, and greatly enhanced the importance of it as distinguished from the limited creed views of the religious parties. It may well be doubted if Mr. Campbell ever delivered a sermon of greater power, or of more direct and useful purpose. There were twenty-six converts at this meeting. Henry, of Trumbull; Collins, of Geauga; Green, of Summit; Lanphear, of Medina; J. H. Jones, of Wayne; Arny, of Bethany, Virginia; besides Moss, Cooley, and Lillie. This was Bro. Jones' introduction to the Western Reserve. He became immediately identified with all our religious work. At this meeting the blessed gospel gave abundant proof of its power to turn the people to the Lord, fifty-four coming penitently to Jesus Christ. This was the largest number yet received at any of these meetings. Brethren Henry and Jones were the Jupiter and Mercurius of the meeting, and their talents formed a good combination for public effect. Henry came as a storm; he spoke with authority, calling to repentance with the fire and zeal of Elijah; while Jones flowed in exhortations of persuasive tenderness, which gained all ears and won many hearts. He was born June 15, 1813, lived for a time in Brookfield, Trumbull County, then became resident with his parents in the county of Wayne, where he was nourished up in the faith and order of the Baptist churches. At the age of nineteen, he heard the gifted John Secrest, near Bucyrus, on the waters of the Whetstone, where he confessed his faith in Christ. From that day he was the Lord's. He traveled awhile with Secrest; immediately and every-where exhorting sinners to "flee from the wrath to come." He improved by the ardent and persuasive manner of that bold and successful preacher, and, like him, he excelled in touching the heart, and bringing souls into the kingdom. prayer, or a stirring song to sustain the life and animation of the meetings. The memory of those scenes is inspiring to the heart. They were joyful with holy enthusiasm, and the new converts were filled with hope. The hymns -- and all sung them -- were, many of them, millennial in sentiment; and held to the heart the hope of the coming of the Lord, and of the glory to be soon revealed. Some described the day of judgment in such pathos and power, as to fasten conviction on many souls. So great was the ardor and zeal, that the gospel in some of its great themes was the subject of general conversation in private houses, as well as of discourse in public assemblies. This congregation has ripened many souls for the eternal kingdom. Among those deserving a record is Bro. Charles F. Bartlett, who, immediately on his conversion in the autumn of 1837, was called by his brethren to positions of responsibility, first as a deacon, then as an elder. Possessed of a genial and affable manner, with a social and warm heart, and ready in speech, his improvement was so satisfactory that on the 22d of May, 1842, he was called to the work of the ministry. His influence increased constantly. He preached in surrounding churches, every-where respected and beloved. But his life was cut short in the midst of his days. On the 5th of February, 1848, he went to his reward. His cheerful, companionable manners and unstinted hospitality, won him many friends. The mourning for him was deep and general. He sustained himself from his farm while laboring for the good of others. Like most of the early preachers, the warfare was mostly at his own charges. Dr. J. P. Robison, whose accession as a member occurred August 20, 1837, soon became a leader by the concurrent wish of the congregation. His intellectual and social qualities, together with his talent for business management, naturally brought him to the front. Few were the enterprises which rendered this church numerous, which were not either prompted or led on by him. Ready to serve, as well as prompt to direct, with the co-operation of the generous helps in the church who stood with him, Bedford rapidly became a radiating center. Bro. Robison yielded to the unanimous voice of his brethren, and on the 25th of October, 1840, he was appointed and ordained as a preacher of the gospel. "Yours is to hand. I am quite happy to learn that the good cause is still progressing in the land of my friends. We have a great excitement here. Many are inquiring, and many are astonished at the doctrine. Up to this time the converts number fifty-seven,1 and the brethren on the other side are waiting with great anxiety for us to come over and help them. They think there never was the like of Bro. Jones, and well may they, for he waxes warmer and bolder in the good cause. All the friends are in health. I may get to see you in Wellsburg. I will, the Lord willing, be at Ohio City the third Lord's day in March. When will you be in Wellsburg, and how long? I hope to go to Bethany. I have said something to them on the prophecies; so has Bro. Jones, who backed me up. My love to all who love the appearing of our blessed Lord. "I get joyful news from Euclid. I hear from twenty to thirty are immersed. I have been with you for days in the spirit of the great turning to the Lord. Bro. Collins and myself are to be in Ohio City, the Lord willing, on Friday two weeks. We would be happy to see you there for a few days, or some time during our stay. Please ride up if you can. "What do you think of the Canada excursion? We ought to let those dear friends know beforehand if we go. * There were one hundred and forty-two converts in the meeting; thirty of them in Pittsburgh. "I am very busy bringing my business to a close. May the Lord bless you and strengthen you with all strength. I feel for you, and should have been over ere this if I had been more propitiously circumstanced. But those bright 'stars' -- heaven alone can reward your exertions. "I am just home from Munson where I got seventy-six additions. I am, as you may calculate, nearly exhausted, after speaking almost incessantly for ten days. But the Lord be praised for his goodness, and mercy, and long-suffering, not willing that any should perish. "Bro. Hayden, I want to see you. If I knew you to be at home, I think I would almost come over. You have heard, no doubt, of the Ohio City thirty. I have got since I returned home from Pittsburgh, one hundred and twelve in all -- four Lord's days. "P. S. The 3d of April is past, and we are still to 'cleanse the sanctuary' by preaching the gospel I suppose. J. P. R.
"I am at Akron -- have been here since Wednesday. Spoke three times, and baptized fifty; among which are Mr. Pickands and family. Speak this evening, and start in the morning for Wooster. Bro. Cook had left some four days before I reached here. Pray for me, Bro. Hayden. I wish you was here. The brethren are happy -- Middlebury brethren and all. We have a happy time. "P. S. My love to Bro. Fitch. "Spoke this evening -- fourteen more. Baptize at eight in the morning, and then start for Wooster. The church was sustained by its internal strength, and by aid from abroad in yearly meetings and protracted meetings, till the year 1856, when Bro. J. O. Beardslee was secured to labor in the congregation. He preached till his appointment as a missionary to Jamaica. After him, the church has been served successively by J. H. Jones, E. H. Hawley, Hiram Woods, A. B. Green, and Robt. Moffett. As overseers, she has had Thomas Marble, Allen Robinett, Enoch Allen, Sidney Smith, J. P. Robison, James Young, C. F. Bartlett, R. S. Benedict, S. F. Lockwood, Augustine Collins, Samuel Barnes, James Egbert, W. B. Hillman, A. T. Hubbell, A. Drake, R. J. Hathaway, Hiram Woods. For nearly twenty years the Board of managers of the Ohio State Missionary Society was located in Bedford, of which Dr. Robison was the continued chairman; and this enterprising church has always contributed liberally to sustain the missionary work. The number of members rose at one time to nearly five hundred -- it is now considerably diminished. SKETCH OF OUR MISSIONARY, J. O. BEARDSLEE. He was born in Bridgewater, Ct., September 11, 1814. In his fourteenth year he united with the Congregational church, and was sprinkled at the time. He would have preferred immersion, but that church would not immerse him; nor would the Baptists, unless he joined them, which would, by their rules, exclude him from "fellowship" with other Christians. In this dilemma he preferred to him the least objectionable course. 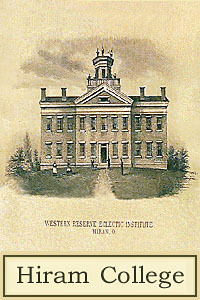 He entered the Western Reserve College in Hudson, in 1833, at the age of nineteen years. His antislavery proclivities took him to Oberlin when presidents Mahan and Finney assumed control there. His class of four was the first that graduated in that institution, in 1837. His studies were all in view of the ministry, and before he left Hudson he had his heart on some foreign mission as his ultimate purpose. While in Oberlin he gathered some converts, one of whom was afterward his co-laborer in Jamaica. In pursuit of better health, he took a voyage to that island, in 1838, just after the emancipation of the 300,000 slaves on the island. Inspired by the congenial climate, and, still more by the necessities of that people, he felt that Providence had selected this as his field of life work. He returned, collected funds in Connecticut and Ohio; was ordained to the ministry in Mt. Vernon, Ohio, and sailed again for Jamaica. For the first seven years his receipts from abroad were only three hundred dollars. He was invited to take charge of the Normal Institution, under the auspices of the British Board of Managers, for fitting native teachers. This post he held seven years, and resigned it to take charge of the Mission church in Kingston, in connection with the London Missionary Society. He lost his companion in 1847; and married again in Kingston, in 1848. "When I left Jamaica in 1855, on account of failing health, I had arrived at the conclusion that the immersion of believers was the only authoritative baptism. After a time, I accepted the charge of a small Congregational church at Rawsonville, (Grafton,) a village comprising representatives of several denominations, no one of them being able to support a preacher. This led me to search for some basis of union. I preached on the subject; and, without knowing the position of the Disciples on that point, I presented what I afterward found to be precisely their views as the only true basis of Christian unity. It was to satisfy the scruples of a young lady on the subject of no creed and infant baptism, that I was led to review the whole matter; and I came to the conclusion that I ought to be immersed forthwith in obedience to the command of Christ. I applied to Elder Nesbitt, a Baptist, who resided in Grafton, to baptize me. He could not attend to it for two weeks, and I went to Wellington to see a Baptist preacher there. But as he would not immerse me except on condition of my uniting with the Baptists, I concluded to wait for Elder Nesbitt. I made known my intentions to the church, and met with no opposition. On the 23d of March, 1856, I was buried with my Lord in baptism. Before leaving the water, I immersed the young lady referred to and another convert. I was then on the eve of a change of location, having accepted a call from the Congregational church in Collamer, with which, and its results you are familiar." direct question, that he could not conscientiously christen their children, they reconsidered their call, and, by a small majority, rescinded it. Thus, and for this reason, turned away by that people from their fraternity, he came that Lord's day evening to hear me, and there commenced our mutual and cordial acquaintance. Meantime William Hayden had heard of him, and of his baptism by Elder Nesbitt. He went to Bro. S. R. Willard, and urged him to go at once and make known to him our plea and ground of union. Bro. Willard was prompt to visit him, and his message of love was favorably received. Hayden also went to Bedford, and made known the case to Dr. Robison, by whose influence the church extended a call to him to visit them, with a view to settlement among them. "On the second Lord's day," continues Beardslee, "we were mutually prepared to accept each other as brethren in the common faith. That was the beginning of a new and blessed era in my life's history. Before, I had been as he who saw men 'as trees walking;' now as the same man who saw 'clearly.'" of churches. Bankruptcy in the missionary treasury compelled his surrender of this most promising field. He left Jamaica in 1868, greatly to the disparagement of the mission work, as he was the needed leader of that great work, of which he had been the father and the founder. From that time to the present, his efforts to collect funds to enable him to go to their aid have only resulted in disappointment to him, and to the greater disappointment of the expecting churches of the island. Among the happy children of this church in Bedford, arose the benignant Harry S. Glasier, a brother, who, in a short time, won to himself the sincerest regards of many friends. He was born in Twinsburg, November 7, 1836, though reared in this church as a nursing mother. He graduated in Bethany, July 4, 1863, and was ordained as a preacher the same day, by Bros. Campbell and Bentley. His devotion and earnestness in preaching brought many to repentance. He was gifted with a warm, friendly heart, was a good talker, and never failed to improve every opportunity for Christ. He married a companion of equal sincerity, and well adapted to his work -- Miss Eliza E. Clapp -- and settled with the church in Belair, Ohio. The congregation grew in numbers and religious feeling during the three years of his ministry there. He was naturally a pastor--"naturally caring for the state" of all the members. He became tenderly attached to the people, and they to him; so that when death came and seized him from them, they mourned as for a near kinsman. He went to assist in a meeting in Pittsburgh where he fell, September 8, 1866. He was carried and laid in the cemetery in Bedford. He left his devoted companion and daughter to inherit his virtues and his excellent name. Bro. Glasier was frank, free-hearted, generous, and unselfish; attentive to all his friends, and of a very sympathetic temperament. He served the people. He served his God, and he took him early. As far back as 1827 and '8, Ebenezer Williams, then an advocate of Restorationism, gathered some converts in Newburg. When the scales of that pernicious speculation fell from his eyes, and he learned the gospel, he sought to undo his work there, and to repair the damage. Some time in the fall of 1828, he appeared among his former admirers, delivered a few addresses, which awakened a marked interest, and left without farther results. In June, 1832, the first convert was gained. It was under the vigorous appeals of the heroic W. Hayden. Two years before, he had started a church in Aurora. Henry Baldwin, of that place, carried an appointment to Newburg, and urged his sister and her husband, Col. John Wightman, to go and hear this original preacher. A large audience assembled in the town-house. Such preaching took them all by surprise. It was neither Universalism, to which they had been accustomed, nor the doctrine of any of the religious parties. It was only and simply the gospel as taught in the New Testament. Many saw the truth, but only one man arose to take his lamp to meet the bridegroom. This was John Hopkinson. He was afterward elder of the church, and stands yet,2 after an interval of over forty years, on precisely the same ground assumed at the beginning. Hayden and Williams continued their visits, holding the ground, and gaining converts. * Bro. Hopkinson has just fallen asleep in the hope of immortality. They shall all be devoted to him." Williams writes, "There were more than half a dozen infidels standing within a few feet, who were very much moved by the scene." The Disciples were filled with joy and the Holy Spirit. They studied the Scriptures daily and diligently to learn the truth themselves, and to be able to teach it to others. They met often for songs, and prayer, and mutual encouragement, and when a preacher came, they had many questions to propound. Thus light rapidly increased, and they became intelligent in the Christian religion. They were zealous to propagate the gospel which shed so much light and joy on their own souls. It was common for the Disciples of Newburg to come to Euclid, (now Collamer,) to meeting, a distance of seven miles; and for these in turn to attend at Newburg to help the brethren there. Each was filled with the joy which inspired all the rest. Happy times! Will they ever return to gladden our hearts? Such zeal with our present numbers would in a twelvemonth set the whole land ablaze! Society in Newburg was full of infidelity. But the gospel never lost a battle. Strong arguments and powerful appeals from such men as Hayden, Hartzel, Green, Allerton, and Moss, laid the foundation of a lasting work, and soon established a church on Bible principles, which has never ceased to meet, nor failed to hold forth the word of life. The "yearly meeting" for the year 1835 was held in Newburg, on the farm of Colonel Wightman. Collins well said of him, "he was a princely man." With the noblest generosity and breadth of views, he made provision both for the entertainment of the people, and for the best business management of the occasion, that the widest possible benefits might flow from it. It was duly announced in Cleveland. Prominent citizens were especially informed and invited. A grove was selected, seated, and covered with boards. All the other members also came heartily to the work, and there was nothing wanting to make the people welcome. Bro. Wightman lodged a hundred guests, and supplied provisions without numbering the participants of his bounty. This meeting was historic. The Disciples, now numerous, came from long distances. Discourses were delivered by Alex. Campbell, Wm. Hayden, A. B. Green, M. S. Clapp, and a few others; and evening meetings were held in neighborhoods around. For four days the meeting, like the manna about Israel, lay round among the people, the subject of thought and conversation by all. A large number of converts were baptized on Monday by Bro. Green. At 8 o'clock Monday morning, the preachers, at Mr. Campbell's invitation, met him in the rear of the tent, to whom he submitted the proposition to hold meetings for mutual improvement. He spoke of it as a school to be continued, in which there should be sermons delivered, subject to examination in matter and style. It was unanimously approved, and the first one was appointed to be held in New Lisbon in the following December. About fifteen preachers met with him that morning. The brethren becoming now well established, they assumed the duties and prerogatives of a congregation of the disciples of Jesus Christ. From that period to the present, the candlestick has not been removed. None of our churches, Warren only perhaps excepted, had preachers or "pastors" settled among them. The casual watch-care and aid given them by the traveling ministers, many of whom were more intent on extending than building up the churches, was insufficient to check dissensions, and to guard the folds from encroaching dangers. Many churches suffered greatly, and some perished. This in Newburg ran low, and its light was nearly extinct. In their extremity they appealed to Bro. Hartzel, who came in April, 1842, and immediately commanded attention by his able statement and defense of the gospel. He lifted it above all mere "church" or partisan religions, and powerfully beat back the forces of infidelity, which had grown strong and defiant. On Lord's day, the twenty-first of that month, he reorganized the church, with twenty old, and fifteen new members. At this time Youngs L.
Morgan and Caleb Morgan came in with their families. The congregation gained such strength that soon after, under the able ministrations of Bro. J. D. Benedict, they built a good house. They have maintained a good testimony, and are now flourishing under the labors of J. H. Jones. For many years their Sunday-school has prospered, and for the last few years especially, by the skillful management of Bro. Browning; and the children are rising up to take the place of their parents in handing down the gospel uncorrupted to generations after them. INCIDENTS OF THE YEARLY MEETING IN 1835. On Saturday night some son of Belial thought to break up the meeting by cutting down a large tree, so its immense brushy top might fall directly upon the seated tent. His mischief failed. The tree fell merely along the edge of it, displacing some of the boards, but not otherwise doing any injury. The incident probably added emphasis to many a philippic against sin and sectarianism. Mr. Wightman had no doubt who the malicious man was who perpetrated the deed. He went to him in the morning and said to him: "If it is any satisfaction to you to commit such depredations, you can do it with the assurance that you can never incite me to retaliate. You may depend on my doing you a kindness whenever it is in my power." set before them. After disposing of his guests one night, Wightman came to Wm. Hayden and said: "Bro. Hayden, the best lodging I can give you is on the floor, for every thing is full." "I will not sleep on your hard floor," said the witty William. So taking two benches he placed them together and camped down on them, saying "Now I am comfortably fixed for the night." Rise of the cause in Euclid -- Church formed by T. Campbell -- Preachers arising, and growing success -- The Church in Cleveland established -- Planting of the congregation in East Cleveland. was, not misplaced, neither were her expectations of his early change destined to be disappointed. Soon afterwards, meeting Rigdon in Mentor, she related the conversation to him. He remarked: "I will go up and take their deacons from them." In the autumn of 1829, he came, preached a few days, and baptized Eri M. Dille, Lurilla Dille, Leonard Marsilliott and wife, Mrs. Perry, Mary Ann Perry, Clarissa Perry, Mrs. Cranny, and her daughter Fanny Cranny. These, with Sister Dille, were associated together for meetings. Rigdon, taking Luther Dille's hand, said: "Will you not go with these young converts and take care of them?" "I will." This was his change; a happy one to him, and blessed to hundreds. He was so full of joy on discovering that salvation is offered to all men in the gospel that he could not sleep. "I always thought," he said, "I was like some whom Paul spoke of, 'ever learning and never able to come to the knowledge of the truth.' The creed and the doctrines of Calvinism I never could see through, but I thought I must accept them, and thought I believed them; but now the gospel plan of salvation is so plain, it fills my soul with joy unspeakable." "I am tired waiting on the people," said Mrs. Dille; "you must let me rest." But he could not sleep. He rose, got his hymn-book and sung, then prayed, and so he spent the night -- too happy to sleep. across the way and called in A. P. Jones from his school-room, who entered and sat quietly down on a low seat. At a juncture, Baily having quoted Scripture in disproof of the "new" doctrine, Jones spoke: "If you would read the whole of that passage it would make directly against your views." "Modesty becomes a young man," said Baily, in contempt. "And wisdom becomes age," quickly replied the young teacher, and then quoted the language. "It does not read so," said the elder. "We shall see," said Jones; and taking out his testament, he read out the exact words he had quoted. Mr. Baily was discomfitted. He was persuaded with difficulty to remain till after dinner. He returned to deacon Hutchinson's, who asked, What have you done with deacon Dille? "O, he has fallen asleep in the lap of Delilah!" In April, 1830, Elder Thomas Campbell came and organized the church in scriptural order, setting apart, by imposition of hands, Luther Dille as elder, and Leonard Marsilliott and Eri M. Dille as deacons. rose up in the church and became very useful in keeping the members together, and adding to their numbers. This young brother was soon on the wing, encouraged by the church, and became very useful as a proclaimer of the gospel. He traveled extensively in Lorain, Huron, Erie, Wayne, and Holmes counties, bringing many souls to Christ. He married Miss Elizabeth Dille, and after a few years he settled in Mishawaka, Ind., where his useful life terminated May 12, 1859, aged fifty-one years. Damon O'Connor, also, was many years a prominent member; and Armon O'Connor, one of the first to embrace the faith, baptized by A. P. Jones, October, 1832, was chosen associate in the eldership with Luther Dille, a position he held with credit for many years, and till he removed to another church. William Hayden was one of the first to sow the seed of the kingdom in this community. A meeting held by him and Bro. Moss in Shumway's barn made a great impression, and is talked of yet, after nearly forty years, as a notable occasion. meeting, were Butler, of Indiana, Hayden, Green, Bentley, Clapp, Moody, Williams, Allerton, Collins, Moss, Veits, O'Connor, Atwater, Brown, and A. S. Hayden. The immediate result was nineteen conversions. This meeting formed an epoch in the history of this church and of the cause of primitive Christianity in all that region. The plea was lifted high into public notice, and many, from this hearing, afterward became obedient to the faith. In October, the following year, a successful meeting was conducted in Euclid by A. P. Jones, Moody, and Robison. Eight additions. mourning-dove. Sleep left him, but "songs in the night" came to him. He learned the hymns, and his mouth was opened with a "new song." He said to Bro. Henry: "I have a brother David. I'll have him here next winter. You must come back and convert him." So spoke the earnest sailor. Henry made a promise, and he never forgot one, that a year hence he would return. Intervening, June, 1839, J. J. Moss and A. S. Hayden held a two days' meeting in the same store-room, resulting in nine conversions. The next February, at Bro. Henry's arrival, both the captains were at home. The younger one discovered in the teachings of the gifted preacher what had never been suggested or hinted in all the preaching to which he had listened; that in the gospel God has made known the way of salvation through faith, repentance and baptism, into the Father, Son, and Holy Spirit; that this, his established order, is open to all men to the end of time. His soul was kindled as he saw the way so plain that "the wayfaring man could not err therein;" and he also turned to the Lord. Several others also were added. Z. Rudolph, H. Brockett, W. Beaumont, C. E. Vanvoorhis, Abijah Sturdevant and Dr. A. W. Campbell. Besides a number of these, there were at the Euclid meeting, Elder A. Bentley, W. Hayden, J. J. Moss, and others. "....From a number of detailed statements we concluded that the number of disciples on the Reserve has nearly, or altogether, doubled during the last year. The churches also are in the very best order; the laborers have been more industrious, more engaged, and, consequently, more successful during the present season. Bro. William Beaumont has immersed 75 in New Lisbon; Bro. Henry, 140 since the beginning of the year; Bro. Wesley Lanphear and J. H. Jones have baptized many; and, indeed, all the laborers have reason to bless the Lord and to renew their courage in the glorious work of saving men." There were 43 immersed at the meeting in Warren, and ten in Euclid. On Monday, Bro. Moss made a stirring appeal for greater liberality in support of the gospel, asserting strongly the need of a brother to be sent out among the churches to arouse them to this duty. William Hayden was his man. He offered to be one of four who would give him the sum of three hundred dollars for a year's labor to this end. "Who will be the other three?" Samuel Miller, late of Willoughby, was quick on his feet. "Who next?" Casper Hendershot, of Euclid. "Now the third?" holding firmly to his point. Bro. Webster, of Mentor, completed the quaternion, and William Hayden accepted the mission. meeting. After several days, and the baptism of twenty-eight, the laborer dispatched a note to Bro. Robison, of Bedford, who was in his carriage in thirty minutes after receiving it, and in ninety minutes more was on the ground, a distance of twelve miles, ready for work. He remained five days. Forty souls were brought into the kingdom. In March, of 1847, Bro. Isaac Errett labored a week, gathering in twenty; and in 1851, the church was increased by the addition of twenty more by Calvin Smith and B. F. Perky. After this, W. A. Belding and J. H. Jones held very successful meetings at different times. The new meeting-house was erected in 1862-3. Elder Luther Dille, having served as bishop of the church over thirty years, with great efficiency and universal esteem, fell asleep, April 18, 1863, aged 79 years. The other churches closed their meetings at an earlier hour than usual, that the people might come and mourn together over a man whose Christian character won the respect of all who knew him. That day the church lost its first elder, who, in all his administration, had been a model of firmness, integrity, impartiality and philanthropy. THE CHURCH ESTABLISHED IN CLEVELAND. near the river. This was before even "Ohio City" was known or named. Hayden replied that he would do so, if an audience could be obtained at 10 o'clock on a certain Monday morning which he mentioned. O'Connor agreed to these terms. About 8 o'clock of the appointed morning, Bro. O'Connor started and canvassed the entire community, visiting every house. One hour and a half accomplished the patrol. Every family was invited, and nearly every one came. The preacher took up the subject of "election," much discussed those times, and in a full and vigorous argument he stated and replied to the leading proofs relied on in support of the foreordination of a select few to eternal life; and in contrast with this unscriptural hypothesis, he opened a free salvation through faith and obedience to Jesus Christ. The sermon was listened to with marked attention, as well for the boldness and novelty of the preacher's manner, as for the freshness and power of the scriptural views he presented. This was in October, 1833. The ground thus gained was never lost. He introduced Bro. Moss and Bro. Green, who astonished the people by their knowledge of the Bible and power in teaching it. Among the first converts were Mrs. Armon O'Connor, baptized by Bro. Moss; and W. B. Storer and his wife, who were baptized by Hayden at the yearly meeting in Richfield, September, 1834. Bro. Hayden preached in the old academy in Cleveland to full assemblies. Some of the converts recently gathered into the church are the fruits of those sermons delivered thirty years before. At the conclusion of the meeting held on Mr. Wightman's farm, in 1835, it was arranged for Mr.
Campbell to preach in the court-house on Monday afternoon at 4 o'clock. It was the old court-house which stood on the south-west corner of the public square. There were only two hours to circulate the word. No time for hand-bills. This appointment was at the solicitation of Thomas Hawley, an intelligent disciple, who not long before had moved from Shrewsbury, England, and was then a resident in Cleveland. At his suggestion, his son Joseph and Armon O'Connor went through all the principal streets, and in clear ringing tones announced in stores, shops, and private houses, that Alexander Campbell would preach in the court-house at 4 o'clock. These messengers were young and active. The whole city heard, and the court-room was overflowing before the hour arrived, all anxious to hear him. appears they had no defined organization, to put forth their champion, as the discomfiture of any other would not be acknowledged by them as the overthrow of their cause. Skepticism in the city of Cleveland was then delivered into the hands of the intrepid Dr. Underhill, to make for it the best defense in his power. As court was to open the next day, the first Presbyterian church, of which the venerable Dr. Aiken was pastor, was freely granted for the continuance of the discussion. "After hearing some other reiterations from Taylor, and some explanations from Mr. Kelley, and some very flattering compliments from my friend Underhill, with the greatest urbanity and good nature we came to a close--I recapitulating the whole, and showing that now, after so long and so patient a session, we had heard these leaders of the skeptics of Cleveland display, if not all they had, certainly the best and the strongest allegations they had to offer. It could not be difficult to see the nakedness of the land of infidelity, the poverty of its soul; when such an assiduous cultivator as my opponent had raised so poor a crop after the toils of so many moons. We contrasted the bearings, the prospects, and the ultimate termination of the two hopes--that of immortality; and that of eternal sleep; the present pleasures of religion and the pains of skepticism; and after a word of friendly exhortation to my antagonists, I bade them adieu. evening of that day to our good but afflicted brother Wightman's, in the country; and, after spending a pleasant evening with himself and family, on the next morning we embarked on Lake Erie for the State of New York. "We had the pleasure," Mr. Campbell adds, "in the midst of our discussions, to be called to the river to hear the confession of six converts who were immersed into Christ by our brother Adamson Bentley." This, it is presumed, is the first instance of baptism by our brethren in the city of Cleveland. The occasion is memorable. The administrator was as venerable as a patriarch; and the converts were trophies of a signal victory achieved over the allied forces of infidelity in the city. The gentlemen who presided, at different times over this discussion, were Elder Bentley, Thomas Hawley, and Tolbert Fanning, of Nashville, Tenn., one of Mr. Campbell's companions in travel. It is eminently worthy of special attention, that all the participants in that scene are now dwellers among the countless tenants of the grave. Campbell, Bentley, Fanning, Hawley, Wightman; M. S. Clapp also, and William Hayden. Bro. Clapp made two speeches in the discussion, in consequence of Mr. Campbell's hoarseness. All these have wheeled into the ranks of that long procession of immortal spirits who are awaiting their crowns. Dr. Underhill sleeps. And now, within a few days, Irad Kelley, Esq., the lone survivor of that group of historic names, is brought from the seaboard where he died, to rest among his kindred dead. in a public assembly of the citizens, Rev. Mr. Aiken declared that to Mr. Campbell was to be credited the downfall of infidelity in the city of Cleveland. In this opinion he only expressed the concurring judgment of other intelligent citizens, some of whom, legal gentlemen of reputation, have so said to me. was quickly on the ground, and made many accessions to the infant church. Soon after, the amiable and gifted Collins, with Robison, held a meeting which resulted in thirty conversions. On the 10th of December, 1843, the church removed to Apollo Hall, east side of the river. In this and in Empire Hall it met about two years -- Dr. Robison and A. S. Hayden alternating in preaching; then, in 1846, the congregation re-established itself in Ohio City. Soon after this, Bro. L. Cooley, who had been an early member here, became their preacher. He was succeeded, in 1852, by Bro. Green, following whom, Bro. Cooley was again employed. In 1860, Bro. C. C. Foot became the pastor; then brethren B. A. Hinsdale, James Canon, and S. E. Shephard served the church successively; the present incumbent is Bro. A. Wilcox. THE CHURCH IN EAST CLEVELAND PLANTED. be set off to form a separate church. The request being granted, the members met September 4th, at the dwelling of Col. Gardner, nominated their officers, and soon after entered on the exercise of their duties as a church of Jesus Christ. resignation. The church has enjoyed the labors also of Isaac Errett and of Dr. L. L. Pinkerton. It is now widening its influence and enlarging its activities under the pastoral charge of Bro. Jabez Hall. The Church in Royalton planted -- William Moody and the Church in LaFayette -- The Cause in Brunswick -- J. W. Lanphear -- The Gospel brought into Granger and Ghent. -- M. L. Wilcox. WHEREVER the gospel was proclaimed it found men tired of sects, and possessed of qualities of character which would stamp them as extraordinary men in any enterprise. Noted among such men, was John Baker Stewart, of Royalton. He was born in Bristol, Vermont, May 10, 1791. He emigrated to Cayuga County, New York, where he united with the Baptists. He returned to the place of his nativity, and in 1817, he started with an ox-team for the Connecticut Western Reserve. Forty-two days steady traveling brought him to Royalton. The primitive forest reigned undisturbed. Not a road was laid out in the township. He selected his land on which he has resided ever since. Of education and solid sense above mediocrity he has held a prominent position in the county. and independence. From Connecticut, where he was born in 1779, he came to the territory of Ohio in 1797. He assisted in surveying the lot lines in many of the townships. He was the first settler in Bazetta, the nearest neighbor being five miles distant. He built the first mills in that region. Every body was hospitable then -- Scofield notably so. In 1817 he was elected to the State Legislature, which position he filled with honor. He took membership with the Baptists in Warren, and soon rose to usefulness. He preached the gospel for many years, and was one of the "charter members" of the church of Bazetta. its full effect on my heart." This was his emancipation, and it opened to him a new era and a new career. contrast with the true rights of man, the high civilization and exalted happiness which would follow the adoption of the Christian religion. From this, he turned toward the more willing inhabitants of Royalton. Supported by such men as Stewart, Scovill, and Leonard, the gospel was firmly planted, though fierce opposition attended every step of its progress. Dr. Hudson left no artifice unemployed. But the truth is mighty, and it won at every encounter. Converts came, and professors of various name saw the gospel ground of union and co-operation, that, in coming to Christ, they came to one another. Among others the manly Dougald McDougall and family, who had been with the "Bible Christians," the excellent and energetic Jewett N. Frost also, who, though they have gone to their "long sought rest," left witness behind them in their zealous labors for the gospel. Marcia Whitney, Samuel Verney, Damaris Verney, Hannah Verney, Catharine Fuller, Decius Barnes. "From this time forward Bro. William Hayden looked after, and took very great interest in the welfare of the church. And when we take into account the small amount of compensation he received for his many trips, over bad roads and through storms, the church hold him in grateful remembrance to this day. Most of the preaching was done by him, by Bro. Scofield, Bro. Green, and Bro. Moody. All these brethren are held in high esteem by the older brethren. "In the year 1835, Bro. Scofield removed to Indiana. Falling sick, he was brought back all the way on a bed. He lived about two weeks after his return, when he went joyfully to meet his Lord." The subject of unconditional personal election, the staple of many sermons in those days, was always a hard doctrine, and difficult to the studious mind of Stewart. He was relieved in the following manner: Hayden, in one of his sermons, declared: "Put election on character, not on person, and the subject is clear. God has always respected character. He has always blessed those who obey him, and punished the disobedient; this is the true election. It rests on character, not on person." This threw a flood of light into his mind, and he walked out of the entanglements of a subject which has bewildered thousands. she said with deep emotion, "Oh, I would give all the world if my heart were changed so I could believe on Jesus." "What would you give," said Hayden, "to believe on Mohammed?" "Oh, nothing at all," she said. "Why?" "Because I believe him to be an impostor." "But why do you wish to believe on Jesus?" "Because I believe him to be the Son of God." "Then you do believe on him, do you not?" "Oh, yes, with all my heart!" "Then," continued the preacher, "if your heart were changed, you would disbelieve him, and be an infidel." She saw her mistake: with a heart already penitent and in love with Christ, she was vainly waiting for some miraculous change. She arose, and was baptized, and went on her way rejoicing. That remarkable man waged a heroic battle for Jesus Christ. Stewart testifies, "A great war spirit was aroused by his preaching." He laid claim to the people as belonging to Jesus Christ, whom Satan has ruined in sin, stupefied in ignorance, and for whom the salves of sectarianism bring no healing. He "gave no quarter to sin, ignorance, nor the devil." In Richfield he preached in a ball-room. At one time he delivered a discourse sitting on horseback. A correspondent writes the first time she heard him was in a saw-mill. Like Paul, whom above all men he admired, and whom he somewhat resembled, he would go to the market, the theater, or the forum, if an audience could there be found to whom he might declare the great salvation. September, 1834. It was a large, orderly meeting, and made a favorable and enduring impression. It carried the force of a great public demonstration. In attendance were J. Hartzel, W. Hayden, E. B. Hubbard, A. Allerton, W. F. Pool, A. B. Green, Wm. Moody, and A. S. Hayden. Many converts crowned the meeting with success. Great harmony prevailed, and through acquaintance the hearts of the brotherhood were knit together. This is veritable Christian unity, which was uniting in the same kindred tie the brotherhood now Widening and extending in all directions. The church of Christ in Royalton still flourishes, and is fulfilling its mission. McDougall became an elder, and died in the faith, honored of all. After a little, Bro. Wm. Tousley came in, was chosen an overseer, and for many years was a pillar. The ministry, who, from time to time have labored among them, have been zealous and faithful. Besides those already named, they have had Scott, Campbell, Burnett, Shephard, Buckbee, Robison, Jones, Cooley, Moffett, Hinsdale, and others on incidental occasions. They now have Bro. H. N. Allen for their minister. WILLIAM MOODY, born in New Hampshire, August 29, 1810, was descended from English and Scotch ancestors. His twenty-third year found him in Ohio. After spending some time in Wadsworth, he settled in Chatham, Medina County. and rejoicing in "the liberty wherewith Christ had made him free," he felt a strong impulse to speak of his saving goodness to others. After coming to Wadsworth, he heard Bro. Green on the subject of faith, in which the preacher asserted that "faith comes by hearing;" (Rom. x: 17) that it is the result of evidence intelligently apprehended by the mind. Moody determined to attack him and expose this false and pernicious position. It denied his notion of the infusion of faith, as a spiritual grace, by a direct act of the Holy Ghost. He thought to panoply himself for the onset by a fresh study and array of his proofs; but he found his strength was weakness. After that sermon his proof-texts did not read to him as before. He was disarmed. The encounter never took place. Having engaged in service with Bro. Newcomb, the youngest daughter of the venerable elder took up the argument two hours an evening for five nights, chiefly on the work of the Holy Spirit and the design of baptism. He contended earnestly for the tradition of the fathers; but the young and heroic daughter of the covenant was too shrewd for him, well taught as he confessedly was in the general language of Scripture. He fell in the debate, and yielding up the ghost of tradition, he found new life and new joy in the clearer and more scriptural knowledge of the gospel. by baptism, recovered others, and founded a church of sixty persons. He instituted meetings, for the new converts, in one of which, forty at a single meeting took a part in prayer and exhortation. Discovering that much feeling pervaded the assembly, he offered an opportunity for confessing the Lord. Seven arose, one after another, confessed their sins, and declared their desire for obedience to the merciful Saviour. They were baptized the next morning. This church has stood firm ever since. Bro. Earl Moulton has long stood as a leader and support to them. Bro. Moody has preached a fourth of his time there for thirty-five years, while his labors in surrounding regions has contributed much to sustain the churches in Sullivan, Wadsworth, Brunswick, Weymouth, Granger, Royalton, Birmingham, and many other places. THE CHURCH IN POMPEY STREET, BRUNSWICK. Early in the year 1835, five families came to Brunswick from Pompey, Onondaga County, New York. Settling together, their street was called "Pompey Street." They were, John Harris, Darius Wilson, Warren Wilson, ----- Chase, ----- Garrett, all, with their wives, members of the church in Pompey. Moss and Hayden soon found them. Great was the joy of these disciples to see again those zealous men who had imparted to them so much light in the east. These two brethren--Bro. Green also, and, after a little, Bro. Wilcox -- built them up and increased their numbers. Dr. John Clarke, a gentleman of weight and respectability, a member of the Presbyterian church, and a practicing physician, gave a candid hearing, and obeyed the gospel. and Darius Wilson were elected overseers, and Dan A. Moulton and Geo. W. Comstock, deacons. He was born in the State of New York, in 1814. Coming to Medina County in 1834, he soon came in contact with the disciples. William Hayden's original manner and point in argument won the attention and enlightened the judgment of young Lanphear. He was, while in New York, converted among the Methodists, his father being of that order, and a preacher of considerable abilities. The Campbell and Owen Debate fell into his hands. He read it, absorbed it, "devoured it." By it he was thoroughly aroused. He next obtained and studied the new translation of the New Testament, then lately published by Mr. Campbell. The Christian religion became intelligible to him, and was invested in his mind with an indescribable interest. He grasped it, and it won every faculty of his soul. He embraced it, being baptized by William Hayden in the yearly meeting at "Bangs' Corners," in September, 1834.
were a great help to each other. The church of Somerset, Pa., which contained many able and influential members, took him under her care and pupilage for a time, receiving blessings from his labors, and imparting of her benefits in return. He assiduously improved every opportunity to fit himself for his chosen calling. His acute penetration of mind, delicate fancy, well stored understanding and agreeableness of manners, won him a welcome every-where. His path to public favor and usefulness was now open, and the history of the cause of reformation in western Pennsylvania, and north-eastern Ohio, and in other States, has, for thirty-five years, been closely intertwined with that of this useful preacher of righteousness. The church in Brunswick passed through the variable vicissitudes which mark the history of most communities, till, by the removals and death of its members, it became nearly extinct. The cause has been revived, and a new church formed at Hamilton's Corners, in the south part of the township. THE GOSPEL BROUGHT INTO WEYMOUTH, GRANGER, AND GHENT. opened. The adventurous pioneer, never waiting for more than half an invitation, promptly consented to go. Soon after, Mr. Reed declared for the ancient gospel, the original ground of union and salvation. He was followed by others, and in the spring of 1832, the church was constituted. It was composed of the following persons: Harris Reed and Sally Reed, Rebecca Lowe, George McCloud and wife, Samuel Crosby, Morris Miller and ----- Miller, Martin Miller and wife, and Conrad Turner and wife. Morris Miller was chosen elder, and Harris Reed and Samuel Crosby, deacons. ceased to hold meetings. About this time, Bro. Wilcox preached with great success in Ghent, a village only a few miles distant, and founded a church there, in which the remaining members in Granger united. Was organized on the 10th of April, 1843, with sixty-two members. Morris Miller, Thomas Pierson, and Alexander Martin were chosen elders; and Thomas Carnaby, Seymour Ganyard, and E. W. Heaton, deacons. Bro. Philander Green writes, (April 3, 1875,) "Only five of the original members remain in the church now." This church has had the labors of Wilcox, who established it, Moss, Newcomb, Green, Cooley, John Encell, Southmayd, and Holland Brown; but longest and chiefly, of Bro. Philander Green. This brother began to preach there regularly in 1850, and for eighteen years he preached statedly at intervals of two or four weeks. In 1853 he moved his family there. Bro. F. M. Green, who has since become prominent in the work, especially in the cause of Sunday-schools, was then in his father's family. From the year 1853 to 1868, the period of Bro. Green's closest labors there, there were one hundred and seventy-five additions; at which time the church, after all the drains upon it, numbered one hundred and fifty-two souls. The last seven years Bro. Green has labored in the church in Lordstown, Trumbull County. united with a pleasing manner, he was one of the most attractive and efficient of the public advocates of Christianity. He was bold and positive, and loved to grapple with strong opposition, especially with the lurking and sinuous infidelity which, at the period of his ministry, had spread much over the Western Reserve. In contending for the faith he rendered excellent service. He was equally vigilant in maintaining the purity of the gospel, as was shown in several discussions, in which he successfully defended the apostles' doctrine against learned and shrewd opposition. He was a native of the State of New York. He was an exhorter among the Methodists when he first heard the Disciples, and with characteristic frankness he embraced it, and in the defense of it spent the best portion of his life. He preached extensively on the Western Reserve, and died in Centralia, Illinois. Early in his ministry he received a contusion in his head from the kick of a horse, from which he often suffered severely. It rendered him sometimes fitful and melancholy. He was therefore not always reliable in discourse. The tinge of sadness in his temperament won sympathy. Admired for his eloquence, and loved for his fidelity and friendship, he gained the esteem and confidence of the people wherever he went. Churches founded in Chagrin Falls -- In North Eaton -- And in Youngstown. IN the winter of 1831-2, A. Bentley moved from Warren to the vicinity of the Falls. The primeval forest reigned on every side. He began to collect the people in the log school-house near by, and to teach them the gospel. It was not long before thirty persons agreed to unite as a church of Jesus Christ. Bentley was the natural leader and overseer, and for one year no other was selected. Then Gamaliel Kent was appointed to assist. The first deacons were Zadoc Bowell and Ralph Russell, both of them disciples before coming to that community. and with it the audience and the preacher. He went in as a standard-bearer; and it was not long before the meetings were located permanently at the Falls. "1. Do the Scriptures teach that to a believing penitent, baptism is a condition of the remission of sins? "2. Do the Scriptures teach that immersion is the mode of baptism? "3. Do the Scriptures teach that infants are subjects of baptism ?" the remaining proposition; but this not being acceded to by the disciples, they consented to spend one day and night on it which was done and the debate closed. By this discussion all the religious elements of the town were stirred to their profoundest depths. The relative preponderance of the two people most directly concerned in it was soon greatly changed. Asbury Seminary was seized with the symptoms of decay; ere long it was abandoned, and the ample edifice became the High School building of the town. Still it must be owned that many causes often concur to affect mutations, and to bring on the ruin of human enterprises. from all traditions and appendages to it, and they were a direct auxiliary to the aim of the church -- to restore Bible Christianity to the world. For several years skepticism brooded over this town, and blighted every thing. It became bellicose, and the traveling emissaries of no faith, no soul, and no God, were encouraged there by the men who scoffed at the faith of Christ and the hopes of immortality. About this time Prof J. A. Garfield, of the Eclectic Institute, was preaching in this church. Mr. Denton, from Boston, a man of marked ability and a practiced debater, was lecturing at Newton Falls, and was soon to march with threatening portent on Chagrin Falls. A discussion was agreed upon between him and Garfield. The power in debate, and the familiar knowledge of the whole field of religious learning involved in this discussion, displayed by Garfield, was a surprise to every one except his most intimate friends. His complete mastery of his opponent was acknowledged; and all the religious bodies of the town rejoiced in the victory. This was in December, 1858. Many times the great tent meetings of the county of Cuyahoga have been held with this church, both exhibiting and cultivating a hospitality worthy of great praise. By them the reformatory principles urged by the disciples won a favorable hearing by great multitudes. The first one was held there in September, 1847; again in 1856, attended by Mr. Campbell, J. O. Beardslee, and the preachers generally. Again in 1864, attended by Prof. Loos; also in 1870.
ever been the home staff. Her overseers were appointed in the following order: Adamson Bentley, in 1831; Gamaliel Kent, 1832; Fuller Pulsifer, 1842; Jedidiah Hubbell, 1845; William Hayden, 1848; King Collins, 1860; J. G. Coleman, 1863; A. Burns, 1869. The following brethren have served as deacons: Zadoc Bowell, Ralph Russell, Amos Boynton, Jedidiah Hubbell, Dr. W. S. Hamlin, Lewis Perkins, King Collins, L. B. McFarland, William Collins, Wallace Collins, Hiram Polly, George King, and Ransom Bliss. Sisters Jennie Burns, Louisa Tucker, and Calista McClintock, are deaconesses of the church. The following brethren have labored in the congregation either as pastors, or as stated supplies: Adamson Bentley, William Hayden, Dr. W. S. Hamlin, W. T. Horner, J. A. Garfield, J. H. Rhodes, B. A. Hinsdale, Sterling McBride, R. G. White, W. S. Hayden, J. G. Coleman, and A. Burns. As transient preachers: A. B. Green, J. H. Jones, B. F. Perky, J. Hartzel, Benj. Franklin, F. M. Green, R. Moffett,. and C. J. Bartholomew. Present number of members, one hundred and twenty-five; the highest number at any one time. The whole number from 1831 to 1875, about four hundred and fifty. resides, who have joined the worshiping host on high. "I went to North Eaton in October, 1840, and found the welcome I expected from Mr. Tucker and his family. Hot tears crowd to my eyes while I remember their earnest hospitality. And when I last was at their old home they had gone from 'this low ground where sorrows grow.' Meetings had been announced at the brick school-house. Many came from various motives; but few, I think, expected to hear or learn their duty. The meeting resulted in the conversion of two sons of Mrs. Tucker. Reuben F. Tucker was the first in Eaton to obey the gospel upon apostolic conditions. The pious mother's prayers were now partially answered; but the work did not end with these." and with two yokes of oxen for a locomotive, plunged in, and finding stations once in every two rods, he brought them through! I never saw a brighter example of the 'pursuit of knowledge under difficulties!'" of the churches in North Royalton, Cleveland, Painesville, and Akron. Bro. Streator came again in October, 1842, and gathered the disciples, numbering twenty-five, into church relations. J. D. Swift was appointed the overseer, and J. A. Ferguson deacon. From that day the church has never ceased its meetings. The zeal of the new converts was tempered into prudence by some older members, among whom stands brother Ferguson, of age and experience in the gospel. The brethren there cherish the memory of the wise and faithful labors of Bro. M. J. Streator with warm gratitude. A brother writes: "Bro. Streator continued his visits, laboring with a zeal and earnestness rarely equaled. This dear brother must ever live in sweet recollection in the memory of this band, the greater part of whom remain to this present time, but some are fallen asleep in Jesus." their ears, naturally enough they cried out: "These people have a new Bible." "Mr. Campbell has altered the Bible just to suit his views." Not a few gave credit to this slander. One man found indubitable proof that the Bible used by the disciples differed from his, for on examination he found a book in it called Philemon -- no such book, he averred, being in his Bible. On one occasion an "Elder" of the "Latter-day Saints" came, and in a long discourse presented the claims of Mormonism. Bro. Streator proposed a reply. The two "Elders" refused him the opportunity; but the proprietor of the house consenting, and the people all wishing to hear the response, the youthful defender of the ancient gospel, in a rejoinder of half an hour, so effectually exposed the new delusion that nothing was left to take root and grow. The congregation received early and able assistance from brethren Green, Moss, and O'Connor. Dr. Butler, of Ridgeville, a physician of extensive practice, who had great weight with the people, met frequently with them. In the autumn of 1843, the location of the church was changed to the center. On this occasion Jared Patchen was chosen overseer, and Chester Cooley, deacon. first a member of the Baptist church, and a lawyer of acknowledged ability. At this time he held the position of State's Attorney for Lorain County. With a frankness and independence of character, as rare as remarkable, he saw and accepted the principles of reform; and closing up his legal profession, like Paul, he gave up his life to the advocacy of the gospel. William Hayden was frequently with the brethren; and William Moody is also well remembered "as handling the Universalists without mittens, and often charging into the battery of Thomas Paine." Successful meetings were conducted by T. J. Newcomb, B. F. Perky, and the lamented Henry Dixon. Calvin Smith left there ineffaceable memories of the blessed results of his earnest and self-denying services. under Col. Garfield, who was at home on furlough, conducted the dedicatory services. And what shall I say more? Time would fail to speak of Chas. McDougall, who, while a student in Oberlin, rendered them efficient aid; of Henry Dixon, whose voice was as refreshing as rain on the mown grass; of W. A. Belding, whose cheerful manner and zeal for his Master's cause, won many friends; of John Reed also, lucid in statement of truth, and able in defending it; of Dana Call, whose worth excels his renown, faithful in Bible study, and candid to a proverb. With Green, J. M. Atwater, the Encells, likewise, S. Fairbanks and others, whose names are dearly remembered. Three great meetings are marked in the more recent history of this congregation: One in 1860, led by C. C. Foote; one in 1861, by D. S. Burnett; the other in 1862, conducted by H. W. Everest. To the home membership is largely due the credit of the success of the effort to plant and sustain the church in North Eaton. Where there is no faithful, well drilled soldiery to march up to the breastworks to "man the ordnance" and stand the shock of battle, protracted meetings, however useful as helps, will be only skirmishes. Nothing gives permanency like the consolidated, constant labors of a harmonious brotherhood in Christ. This church was born in the agonies of fierce contention. In no place does the history of the planting of the church on its New Testament basis display a greater virulence of opposition. In March, 1841, a discussion was held between J. Hartzel and Rev. Waldo, a Congregationalist, which made a profound impression. Conversions followed, and a number of Mr. Waldo's friends were baptized into the Lord Jesus. Along with this result, it stimulated a malignant opposition to the principles of the reformation. The watchmen on the walls of their local Zions were alarmed. The Rev. Dr. Boardman, pastor of the Presbyterian church, sounded the war-trumpet, and rushed full armed into the arena. Elder J. J. Stedman, of the M. E. Church, panting for more laurels than he had won on the martial fields of Newton Falls, Bedford, and Chagrin Falls, encountered Hartzel here in a discussion of two and a half days, on the question; "Is baptism in any case necessary to the forgiveness of sins?" All the stars of that firmament in their courses fought against the cause represented by the faithful few who were striving for nothing but the Christianity of the New Testament. The members banded together. The church formed. Brethren Henry and Lanphear seconded these efforts of Hartzel. Conversions followed, and the cause began to rise. In August of this year, 1842, Mr. Campbell came to the Western Reserve. Touching at Fairfield, where he addressed immense congregations, he passed on to Warren, and addressed the public on Christian union, and on education, after which he proceeded to Youngstown. asked him to do in his presence what he had attempted when he had no respondent. Mr. Boardman's courage failed him, and he refused. He would not permit Mr. Campbell to examine his manuscript, that he might reply fairly to his erroneous charges, nor to use his church, nor would he attend and hear him on the same subjects. Mr. Campbell then, in the house used by the brethren, in the presence of a very large audience, after briefly rehearsing his interview with Mr. Boardman, gave so able and candid a statement of his true position as to gain the feelings of a large portion of the uncommitted citizens in their favor. From that day to the present, the light has never gone out of the church in Youngstown. Bro. J. W. Lanphear was first secured as its pastor. In March, 1843, he resigned, and returned to New Lisbon. ANNUAL MEETINGS IN OHIO, 1843. The meeting in New Lisbon, Columbiana County, was well attended. I had not the pleasure of being present. Thirty-eight were added by baptism. The annual meeting of the brethren in Trumbull County, at Youngstown, was the largest assemblage of persons ever witnessed by any of the ministering brethren present. I have seen very large religious assemblies in Virginia and Kentucky, but none equal to this one. It was variously estimated from six to ten thousand persons. Had it been a political meeting, the general opinion was that it would have been put down at ten thousand. Knowing how wont men are to exaggerate in numbers on such occasions, I choose rather to regard the minimum of six or seven thousand persons as more nearly approaching the actual number in attendance. The number of disciples present probably amounted to some two thousand. The immense audience assembled in one of the most beautiful and commodious groves in the immediate environs of the village of Youngstown, which was courteously tendered to the brethren by the proprietor, Mr. Wick. A tent provided by the brethren, covered only some two thousand persons. The remainder, covered by the umbrageous boughs of a dense grove, enjoyed equal comforts with those under the tent. During the whole meeting of three days not a single accident or unpleasant incident occurred. The most perfect attention and good order seemed universally to obtain. During these three days some fifty made the good confession, and were baptized. Many ministering brethren, probably some thirty or more, were present, and the meeting was truly refreshing and peculiarly pleasant to all. "NO. 1 BOND STREET, N. Y., March 23, 1843. "In conversation with Dr. Spring, last evening, he stated that, in the original the word baptism, which we find in the New Testament, has no definite or distinct meaning; that it means to immerse, sprinkle, pour, and has a variety of other meanings--as much the one as the other, and that every scholar knows it; that it was the only word that could have been selected by our Savior, having such a variety as to suit every one's views and purposes. May I ask you if your knowledge of the language from which the word was taken has led you to the same conclusion? and may I beg of you to let the deep interest I take in the subject plead my apology. "I have the honor to be, with great respect, most respectfully yours, E. PARMLY." "COLUMBIA COLLEGE, March 27, 1843. From Campbell and Rice's Debate, pp. 171, 172. The intrinsic weight of authority of this testimony, enforced alike by the noble bearing and earnest manner of Dr. Parmly, gave it great effect with the audience. And in the hands of Mr. Campbell, in the Lexington debate, which followed in about two months, it was a bolt which evidently staggered the mailed Mr. Rice. This church has many years maintained the "unity of the spirit in the bonds of peace." W. S. Gray, W. S. Hayden, while teaching, have also preached for the congregation. James Calvin has rendered a very efficient aid, and Dr. Whitsler also, in keeping up the meetings. In the beginning of the congregation, Bro. John Kirk, by his talent for management, dash, and zeal, contributed very much to the success of the gospel in the hands of Henry, Hartzel, Jones, and Samuel Church. Under the acceptable pastorate of Bro. C. C. Smith, the church is rising to greater strength. They have recently completed a costly and elegant meeting-house, and are in a position to command public respect. LESSONS OF OUR FORTY YEARS' EXPERIENCE..
1st, The Bible contains God's only and complete revelation to man. 2d, It is to be interpreted by the ordinary, established rules. 3d, It is to be interpreted by every man for himself. On these three propositions is founded a broad corollary, viz: The Bible, thus interpreted, will inevitably lead Christendom out of its leopard-like sectarianisms back to the original, divine unity, and restore to the church her lost power for the conversion of the world. On this bottom we put to sea. Not a leak has yet been found. The vessel has proved herself seaworthy. Her hull is as sound as when she was launched. Not a plank has stirred. She has weathered many storms and rode out many tempests. She has been attacked by the war-crafts of nearly all nations, and is proved to be invincible. only object personal of our faith, our love, and our obedience; and the whole Bible is the "testimony of Jesus." This is our plea, and it is invulnerable. It never can be overthrown. "The gates of hades shall not prevail against it." It can not be improved. We are not advocates of a reformed religion, but of religion itself. Christ's religion can not be reformed. He is himself the author and the finisher of his most holy religion; and, like himself, it is perfect. This to proclaim, this to defend, on this divine basis to re-assemble, and re-incorporate the divided battalions of the Captain of salvation; this is our purpose, our work, and our plea before the men of this generation. II. Our forty years' experiences teaches the necessity of a due adjustment of the evangelical and pastoral work. Under Walter Scott a new order arose. It was given to him to blow the trumpet of the gospel. His work was purely an evangelism. The matters of the Christian religion are classified under two fundamental departments -- the evangelical and the ecclesiastical; or, the gospel and the church. The gospel is prior to the church. The evangelist forms and establishes the church. This work accomplished, there begins another class of agencies specifically described in the New Testament: This is the eldership, or pastorate of the church. "sects" would surrender, or be blown to atoms. Nothing was looked for but the immediate triumph of the gospel over all opposition. Nor must this ardent hope be accounted a mere enthusiasm, or be handed over to the credit of an overestimate of the importance of the views of the gospel just then freshly brought to light. The law of Moses was "weak through the flesh;" so, under the gospel of Christ, there is a human side in the affair. Here is where the failure lies of realizing, the high hopes of the most brilliant success. Thoughtful men predicted this at the beginning. The admirable Osborne saw it, and lamented the absence of a system for holding and training the converts. William Hayden foresaw confusion, and a coming disappointment of the mistaken hopes of the more ardent. They remonstrated with Scott, but that angel of the tempest, beholding victory on all sides, blew louder his silver trumpet of salvation, and replied: "O, convert the people, and give them the Holy Ghost, and they will be safe!" Benajah Austin, a man of sense like a governor, said to Bentley and Henry: "You must stop; the longer you go on the worse it will be. It will come to confusion. If you go on twenty years in this way it will be all the worse, for you will have to stop at last. There must be suitable men appointed to take care of the converts." surprising, then, that some converts fell away? that churches languished, and that numbers of them fell into dilapidation and were extinguished? If the due adjustment of these two agencies had been suitably disposed at the beginning, it would have resulted in far greater strength and prosperity. It is a marvel that the churches have stood so well--a proof of the truth and power of the principles of our pleading, rather than of the skill or wisdom of our management. III. It was a mistake to start so many churches. This error was a result of the exuberance of evangelical zeal already noticed. For this there is much apology in the inexperience attending the beginnings of the enterprise, and still more in the lack of men to maintain the ground conquered by the aggression of the heroic evangelist. These cases of neglected congregations are referred to as examples of failure. They oppose now the most formidable obstacle in the way of lifting up the cause into new life. fox go up upon it, he shall even break down their stone wall." The reproach passed unheeded. Every year, not one excepted, the bishop of Ohio has made his parochial visit to this feeble parish. Scarcely has he once failed to "confirm" new members of the body. The interests of that cause have been looked after with a vigilance reflecting credit to that people; and, it now stands as a monument of their undeviating perseverance. Is it an evidence of strength in Episcopacy? would it be a proof of weakness in us to adopt a similar policy? Is it strength there and weakness here? Is it surprising that intelligent, discerning citizens, casting about for a "home," turn from a people where they see evidences of looseness in plan, and weakness in system, and yield themselves up in membership to organized bodies who conduct their enterprises systematically and successfully? Our gospel has won many friends who have been lost to us through feebleness of plan and want of system. It would be neither wise nor just to heap reproaches, as is the habit of some, upon the fathers and pioneers of our religious work, for the misdirected efforts of the early part of our history. This wisdom to direct could be learned only by experience. And this skillful adjustment of materials could be made only when there were materials to adjust and to manage. But on us, the factors of this age, will justly rest reproach, if with the past as a lesson, we do not see where to improve. Still more, if seeing, we refuse, on account of willfulness or indifference, to rectify our errors and to labor for reform in our methods. IV. THE WANT OF RECORDS. In the opening of our plea on the Western Reserve the iconoclast was among us. He wrought for us, though in a far less honorable sense, the work which Goethe said was accomplished by Lord Bacon. "He took a sponge and wiped from the tablet all records of former knowledge." The cry ran -- clear away the rubbish, that the foundations of the Lord's house may be laid. Reformation is one thing, demolition another, and restoration still another. Discrimination did not well rule the hour. No records were kept after 1828. Some of the churches thought it a violation of this reformation to have any records whatever, even a list of the names of the members. There was no authority for it in the word of the Lord. "Where the Scriptures speak, we speak; where they are silent, we are silent." The noblest of rules; but, applied to mere prudentials, most egregiously misapplied. So, as the Scriptures gave no instructions about church records the whole matter was ruled out of order, and out of the church. Alas! what has been lost by this misdirected zeal! The zeal was good, but the wisdom was the essence of folly. What would we not give now for a continuance of the records of the Mahoning Association, which met two years under that name after the records ceased? Why were there no records of our yearly meetings? What rich and abundant materials for future history and instruction? which have given us so many communities for Jesus Christ? Who now, from any preserved records, can tell the history of Henry, that swift messenger of the glad tidings? In vain we question records for an account of his conversion, his baptism, and how he came forth from being a driver of oxen and a bugler for regiments, to become a leader in the embattled hosts of the armies of the living God. And Brockett, the blessed; and Smith, the saint; and Collins, the colleague of the honorable! In these pages, personal knowledge and gathered data have, in part, supplied this lack. But this source of information is, with the passing generation, rapidly going down to the dumb grave; the silent receptacle of all things human. The scribe was a man of high authority among the Jews, a little vain, and a sweep of his robe somewhat too ample. The horn of oil made the nation jubilant when it was emptied in the consecration of a priest or a king. But the horn of ink has made many nations joyful by its recitals of their deeds, and its transmissions of their jubilees. Oh, that Scott had kept a diary! that our earlier men had written as well as talked! Thanks to Baxter; whose skill and zeal have evoked from the tomb of the mighty, a history distinguished both for its beauty and its truth. Of what infinite embarrassment would he have been relieved by contemporaneous records! muses, to record in fitting terms the grand anthem of their heroism and their triumph. Shall the next generation find this one as barren of records as we find the past? V. Once more. All our past history proclaims the necessity of a combination of effort to advance the gospel. This cause originated in conventional effort. After three years these associational plans were laid aside, and we subsided, on this point, into a state of apostasy. During the last twenty years we have been slowly recovering and steadily returning to our first works. In August, 1827, ministers of the gospel assembled in New Lisbon, selected an evangelist, and sent him into the field. This action gave us Walter Scott. In 1828, the churches were again represented by delegation in Warren. This convention chose and sent out Walter Scott and William Hayden. In 1829, the association repeated its work, sending into the evangelical field four men -- Scott, Hayden, Bentley, and Bosworth. 1st, These evangelists were selected and sent out by the ministry of the church acting in their delegated capacity. (c) They arranged for their compensation. contributions and other material ways they assisted and co-operated in their work. It should be farther noted, that Bro. Campbell was the prime mover and the active leader in this scheme of associational effort to bring an evangelist into the field. This movement was conducted with the most perfect unanimity, not a dissentient in that body. It was the action of the soundest, wisest, most deliberative, and prudent men. The twenty years succeeding is the period of our anarchy. During this time we had no concert, regular or irregular, stated or incidental, if we except some ineffectual efforts to bring a better order into existence. The great saving power was the yearly meeting system. This, serving as a bond of union, was a powerful support to the cause. These meetings were the conservation of the churches. They were aggressive, adding multitudes of converts. By diffusing a general, personal acquaintance, they cultivated a strong tie of brotherhood. Yet with all their benefits, which were neither few nor weak, they were not organic. They sent out no missionaries; they called for no reports; they performed no action for the churches, nor for the systematic diffusion of the gospel. They came as a cloud with blessings, poured out their treasure of good, and departed. During these years many attempts were made to form co-operations. They were failures. The cry of priest-craft, or, sectarianism, was alone sufficient to blast the effort for order. November, 1850. Slowly at first, amid doubts and opposition, it got under way. It gained rapidly, and won the confidence of all the brotherhood in north-eastern Ohio. The chief glory of that institution has not been told: which was, that it created a most desirable and useful general confidence among us. We united. We joined hands around one good enterprise. The purpose succeeded, and vindicated the most useful sentiment of union in action. May this lesson never be lost. As the noble Eclectic Institute, of many happy memories, has not died, but has succeeded in a still more noble and useful Institution, our beloved Hiram College -- long may it prosper--so let this general unity of confidence, to which it gave birth, grow into all that is desirable in the formation of all needful plans to send forth the gospel as at the beginning of our blessed work. This confidence is transferring itself to our missionary work. Around this society let it rally till it shall become a permanent power in the land! V. LAST, BUT NOT LEAST. As this blessed cause, so dear to our hearts, has maintained itself in all vicissitudes, has braved all opposition, and still flourishes with little combination among its leaders, will our forty years' experience, if questioned, speak out and tell us the reason? I answer most unequivocally, it will. Its answer is in 2 Tim. 4:1, 2. " ----------- preach the word!" This is the only solution. This answer is complete. the Henrys, and the Smiths; the Otises, the Waits, and the Violls. They preached the gospel. They were no mere essayists. They were not theorizers, nor speculatists. They preached Christ and him crucified. In this they were a unit. The same gospel was preached in every town, county, and school district. They used their Bibles. They read, quoted, illustrated, and enforced the Holy Scriptures. This lesson is all important. We must "preach the word," not something about the gospel, but the gospel itself. Some of our preachers should sit at the feet of the departed veterans, and learn to speak and enforce Bible themes in Bible words. Let us have more Scripture, in its exact meaning and import; more gospel, more of Jesus, his will, his mission, and his work. This was their power. It will be ours. Most of all, and last of all, we impress this lesson: preach the gospel in season, out of season. Preach it as Peter preached, as Paul preached it. Be not weak, nor ashamed of its facts, commands, and promises, as delivered to us by our fathers; and to them by the holy apostles. AN ABBREVIATED ACCOUNT OF CHURCHES OMITTED, OR RECENTLY ORGANIZED. ALLIANCE, Stark Co. -- Organized March, 1857, with thirty members, by P. K. Dibble. Elders; Asa Silvers and Elwood Patterson. Deacons; Mathias Hester, H. H. Hubbard, and Edward Pettit. Preachers succeeding Bro. Dibble; A. B. Way, J. Pinkerton, Isaac Errett, J. H. Jones, F. M. Green, E. L. Frazier. Present number, three hundred and thirty-five. Elders; A. W. Coates, J. W. Phillips. Deacons; M. Hester, Saml. Miller, J. C. Sheets, Wm. Watson, J. C. Sutton, J. M. Fogle, G. W. Thornberg. AUBURN, Geauga Co. -- Formed April 10, 1841, with twenty-nine members, by A. S. Hayden. R. Granger, overseer; John Brown and Jonathan Burnet, deacons. This church has been aided by most of the preachers. They have a good house, and continue to meet. BAZETTA, WEST, Trumbull Co. -- Organized December 16, 1848, by Calvin Smith, with forty members. Levi Bush and Alden Faunce, overseers; Ellis Pierce, Jas. Sage, and Jacob Dice, deacons. This church has received help from most of the preachers. Present elders; Hiram Wilber, Milo Crawford. Deacons; Jacob Shaffer, John Wier, and Jas. Wier. One hundred and four members. W. O'Connor, J. Encell, and R. G. White. Bro. G. W. Mapse, of Illinois, arose in this church. BROOKFIELD, Trumbull Co. -- The ground was broken as early as 1828 by Hayden, Henry, and Hartzel. A church was formed there February 22, 1875, with thirty-three names. Deacons, Robert S. Hart and Henry Hamilton. Present number, fifty-eight. Arnold Taylor, Henry L. Patterson, and Jesse Hoagland, overseers. BRISTOL, NORTH, Trumbull Co. -- In 1860, H. Reeves baptized twenty-eight. In 1868, J. N. Smith added fifty-five, when by him and N. N. Bartlett, the church was organized with ninety-two members. The elders were Hiram Thayer and A. A. House. The deacons: Jacob Sager and S. A. Davidson. A live church with a good house. Dr. I. A. Thayer and D. P. Thayer, preacher, arose here. E. Wakefield has been a chief support of the church. CAMDEN, Lorain Co. -- Organized May 21, 1842, with five names; John Cyrenius, elder. Established in Kipton, November 27, 1872, with thirty-eight. Daniel Kingsbury and R. C. Eastman, elders; deacons, H. H. Crandall and James Van Dusen. Present number one hundred and thirty-four. Officers: James Van Dusen, Wm. Anderson, and Hiram Prentice, elders; deacons, H. H. Crandall, Chauncey Close, Wm. Douglass, and Frank Danzy. Pastor, James Vernon. CHESTER, Geauga Co. -- At the instance of W. A. Lillie and A. Harper, Bro. Hartzel came in October, 1842, when the meetings began and continued. Reorganized October, 1852, by C. Smith and A. L. Soule. Alonzo Matthews, overseer; Cyrus Millard and A. Scott, deacons. A. Burns, W. A. Lillie, and J. G. Coleman, efficient helps. Present officers: C. Millard, A. Harper, and C. H. Welton, elders; Porter Scott and Albert Phinney, deacons. About forty members. DENMARK, Ashtabula Co. -- Planted January, 1857, by Orrin Gates. It had sixteen members; S. S. Chapman and D. G. White, overseers. This body dissolved in a few years, but it lives in its representatives. Four preachers came from it, viz. : S. S. Chapman, and the three brothers H. J. White, D. J. White, and R. G. White. Turnbull, elders; and Jesse Rogers and George Stump, deacons. Succeeding helps: E. Wakefield, F. M. Green, B. A. Baker, D. C. Hanselman. Present number sixty-five. Linas Rogers, preacher. Three preachers, brothers, have arisen here, viz. : Edwin Rogers, Linas Rogers, and W. H. Rogers, sons of Jesse Rogers. ELYRIA, Lorain Co. -- It began in the tour of Clapp and Rigdon in 1829. Wm. Hayden soon came, followed by Green, Moody, and Jones. Church formed in 1832. It increased till there were forty members. Chief men: Herrick Parker, H. Reddington, Asahel Parmly, Dr. Butler. It expired by removals. J. D. Benedict came into the work here, leaving the bar to plead the gospel, in which he won many converts, and a wide reputation. FAIRFIELD, NORTH, Huron Co.--At the request of Ezra Leonard, A. B. Green came July 4, 1835. In 1836 he returned, accompanied by J. J. Moss, when the church began, with Jonas Leonard and ------ McLain, elders. W. A. Lillie, Dana Call, and Wm. Dowling; continued the work. In 1854 the church, was organized in North Fairfield with over thirty members, by the lamented Henry Dixon, whose preaching created a wide and profound interest. Many also united under the preaching of A. Burns. Present elders: Isaiah Cline, D. H. Reed, and Bro. Culbertson. FOWLER, Trumbull Co. -- Started January, 1832, with thirty members, by J. Applegate, assisted by A. S. Hayden. Early evangelists; Wm. Hayden, Bosworth, and Allerton. Reorganized March, 1851, by C. Smith and J. T. Phillips, with thirty-five members. Elders, A. W. Porter and Milo Dugan; deacons, J. L. Jones, Menville Tyrrell. Succeeding elders, A. Humeston, Chas. Fowler, H. C. Williamson, and David Campbell. Deacons following: Hiram Porter, James McCleery, Alex Campbell, Addison Dawson, Jasper Kingsley. Present officers; A. Dawson, Lewis Alderman, Menville Tyrrell, overseers; N. C. Fisk and S. J. Rand, deacons. Frederick Dickinson; deacons, D. Foot and H. Saunders. Number of members, one hundred and fifty-seven. HAMDEN, Geauga Co. -- This church originated in the labors of Rigdon and Collins. By the latter it was formed in 1829. Geo. Hale, overseer; John Bartholomew, deacon. Sustained chiefly by Thos. Campbell, Clapp, and Collins. In 1848 there were yet twenty-four members. Sometime after this it ceased to meet. HUNTSBURG, Geauga Co. -- It arose in 1829, by the labors of Hayden, Henry, Collins, and Saunders. Brethren Howells, Chapin, Moss, Brackett, and Clarke, stood long and firmly on the ground. In 1848 they enrolled still twenty-three members. Lillie, A. P. Jones, Robison, and White, have also rendered important service there. A number of members still hold the house, and represent the church. HAMILTON'S CORNERS, Medina Co. -- This congregation arose in the labors of J. Encell. It was organized by A. B. Green, July 23, 1871, with thirty-six members. The overseers are S. T. Adams and Chas. Kenyon; W. H. Floyd and O. Birchard, deacons. Brethren Moody, Gibbs, and I. A. Searles, have been helps. Present number, sixty-three. HARTSGROVE, Ashtabula Co. -- Formed November, 1854, by C. Smith and O. Gates. J. Bartholomew a frequent aid. Leading members; A. Watson, N. Hubbard, I. Y. McKinney, and Edward Lee. Present number, sixty-five. HARTFORD, Trumbull Co. -- Began in the labors of Hayden and M. Bosworth. Formed May I, 1830, by Hayden, with twenty-two members. Geo. W. Bushnell, overseer; Elihu Bates, deacon. In 1838, Alex. Spears was chosen elder; and John Bates, deacon. Orris Mason, J. B. Jones, Sam'l Bates, and Abner Banning, have also served as deacons. Present overseers, G. W. Bushnell and James Fowler. Number, fifty. HINKLEY, Medina Co. -- Organized February, 1870, with fifty-four members at the close of a successful meeting held by R. Moffett. Dr. G. S. Gillett and Geo. E. Weber, elders; John Mussen, Lewis Finch (now deceased), C. J. Green, and Rich'd Dunham, deacons. H. N. Allen preached four years there; now H. B. Cox. A good church property. HOWLAND, Trumbull Co. -- In 1828 there arose a church in Howland, supported mostly by the brothers Drake, a noble family of devoted Christians, and Zephaniah Luce, Lewis Heaton, and other families. It is dear for the faithfulness of its members, and for the labors of all the early preachers; the Campbells, Scott, Bentley, Hayden, Henry, Bosworth, Hartzel, and many others. The church holds the ground still for the Lord. JACKSON, NORTH, Trumbull Co. -- Planted in the fall of 1852, by C. Smith, with fifty persons. Reorganized May 23, 1874, by H. D. Carlton, with thirty-four members. Elders, W. B. Dean and Joseph Pierce; deacons, Jas. Russell, Geo. Shively, and Christian Shively. Mary Shively, Mary Anthony, and Belinda Kirkpatrick, are the deaconesses. Present number, forty. LITTLE MOUNTAIN, Lake Co. -- Organized by D. Otis, April 6, 1843. Forty-seven members. D. Otis and E. J. Ferris were the overseers; Wm. T. Rexford and Chas. Tuttle, deacons. It survived the death of its founder, the zealous Dexter Otis, a few years. In December, 1857, it ceased to meet, and the members united with contiguous churches. MIDDLEBURY, Summit Co. -- Started March 30, 1875, with ninety members, under the labors of R. G. White, aided by H. J. White, who is in charge of the church, with Dr. M. Jewett and Almon Brown, as associate elders, and T. H. Botsford and Geo. F. Kent, deacons. MONTVILLE, Geauga Co. -- Dr. Lucius A. Baldwin solicited O. Gates to come, who added fifteen, and organized the church, February 12, 1860, with seventeen. Dr. Baldwin and John Murray, overseers; Steven Case, first deacon. The church prospered. Anson Shaw, superintendent of the Bible-school. Meetings have been held by Gates, Burns, R. G. White, Hanselman, Ingram, Wakefield, and Thayer. N. P. Lawrence is their preacher. MORGAN, (ROCK CREEK,) Ashtabula Co. -- Church formed May 4, 1874, with over a hundred members. The elders are M. Bretell, D. S. Bacheldor, and H. Pifer; deacons, J. Knowlton, D. R. Phillips, H. Moses, and V. D. Latimer. They have an active Sunday-school, and a valuable house, for which they owe much to the liberality of Mrs. Randall. NILES, Trumbull Co. -- In 1842, H. Brockett and J. Henry built up the church with 90. Joshua Carle and A. J. Luse were the first elders; Lewis Heaton, Abner Fenton, and Jacob Robinson, were deacons. Present officers: Benjamin Leach and L. L. Campbell, overseers. Bro. H. Baldwin served 24 years--recently deceased; deacons, H. J. Mason, Lewis Reel, and Stephen Dunlap. Present membership, one hundred. N. N. Bartlett, pastor. NORTON, Medina Co. -- This arose from the church in Wadsworth. It was organized in 1837. It had about twenty members. A. B. Green and Gad Bronson, overseers; John Bunnell and Ananias Derthick, deacons. The Bennetts, E. Spicer, C. Beckwith, S. Tyler, Philander and Calvin Green, were leading members. It continued till 1863. P. Green arose here, and also L. L. Carpenter, of Indiana. ORANGE, NORTH, Cuyahoga Co. -- Formed by A. S. Hayden and M. N. Warren, June 28, 7845, with fifteen members. It increased to about seventy. The elders from the first were Wm. T. Hutchinson, Ira Rutherford, Selah Shirtliff, Silas Y. Dean, Wm. Shelden and Allen Tibbitts; deacons, Ira Rutherford, Allen Tibbitts, Wm. Shelden, Marcus Lindsley, Henry Halsted, Luther Battles, Jr., and Addison Hoose. After twenty years of useful history, emigration, the foe of churches, ended its existence. ORANGE, SOUTH. -- Planted March 2, 1845, by Bentley and Wm. Hayden. It had seventeen members. Amos Boynton and Zenas Smith were the overseers; W. A. Lillie, M. N. Warren, and Solyman Hubbell, were useful helps. now of Kentucky University, was ordained by A. Bentley and Isaac Errett, April 18, 1855. W. B. Hendryx began here his useful career. SOUTHINGTON, Trumbull Co. -- An old, stable church. Most of the Baptists accepted the principles of reform, when this congregation started in 1828, under T. Campbell,--by whom Sam'l Haughton was baptized,--and Scott and Applegate. It has always kept the light burning, and now numbers about one hundred. Present elders: Wm. Bronson, Wm. Haughton, and Harvey McCorkle; deacons, Henry A. Haughton, and Charles Wannemaker, who is clerk. SOLON, Cuyahoga Co. -- This church has a rich history. It arose by the labors of W. Hayden and A. Bentley, when S. Norton, H. Baldwin, S. D. Kelley, L. S. Bull, C. Jewett, and others moved in from Aurora. The church was reorganized, November 29, 1841, by M. L. Wilcox. Simon Norton, S. D. Kelley, elders; Henry Baldwin, C. Jewett, and L. S. Bull, deacons. In March, 1842, E. Williams held a meeting, when J. M. Hickox and wife, and many others united. Most of the preachers have held successful meetings here--Jones, Green, Hartzel, and Perky. As regular supplies, Garfield, Everest, Hinsdale, Hill; present pastor, C. M. Hemry. Chief men in later times, C. B. Lockwood and E. C. Parmlee. Present number, one hundred and fifty. THOMPSON, Geauga Co. -- Formed January 1, 1848, by E. J. Benjamin, with thirty names. Jacob Norman and Simon Baur, elders; Paul Baur and Hiram Stevens, deacons. Bro. O. Gates was a frequent and efficient help, by whom many were added; also H. Reeves, E. Wakefield, and J. W. Errett. Later, J. G. Encell, R. G. White, J. W. James, Bartlett, Ingram and Cook. Present number, severity, with Chas. W. Foot and Simon Baur, elders; and Paul Baur, Lewis Keener and Henry Malin, deacons. TRUMBULL, EAST, Ashtabula Co. -- October, 1858, Bro. Gates, assisted by J. G. Encell, held a meeting here, ending with twenty-eight conversions, when the church started with forty-five names. Wm. Nelson was elder; and Harvey Curtiss, deacon. H. Reeves and J. Bartholomew, were cooperating preachers. WARRENSVILLE, Cuyahoga Co. -- The Mormons having made inroads here, A. Bentley, following them up, rescued several, and baptized Mrs. Louisa Hubbell, in May, 1831. The church was set up by Wm. Hayden and J. J. Moss. Isaac Moore was a leading member. The brethren of Newburg and Cleveland met with them. Soon Solyman Hubbell and A. T. Hubbell were appointed elders. Moses Warren, baptized at the yearly meeting in Newburg, 1835, was a deacon and an elder. In December, 1842, a meeting was held by Collins, Alton, and A. S. Hayden, resulting in forty-nine conversions. In September, 1843, a great yearly meeting was held there by Hartzel, E. A. Smith, of Ky., and eleven other preachers. The church flourished many years, till it was dismembered by death and removals. WILLOUGHBY, Lake Co. -- The members on Waite Hill and about Willoughby were congregated as a church in that town, September 28, 1873, under the auspices of the O. S. Miss. Society, R. R. Sloan and A. S. Hayden officiating. Elders, A. B. Green and W. A. Lillie; deacons, H. H. Hall and H. J. Randall. It began with thirty-nine names. Present number, eighty. It has a good Sunday School, and is flourishing under the charge, as preacher, of A. B. Green. SULLIVAN, Ashland Co. -- The church in Sullivan was established through the agency of Sylvanus Parmly and his amiable family. He was a gentleman of much intelligence and weight of influence in the county. He and his family learned the gospel in Elyria. In the year 1832, having moved to Sullivan, he opened meetings. At his instance Wm. Hayden came; his singing and sermons won the people, and fourteen were associated as a church. A fiery opposition, cruel in its perversions of truth, assailed the work, but it was nobly defended by the intelligent sisters as well as the brethren. Moss, Green and Moody, heroically seconded their efforts; John Henry held there successful meetings, as did also John Reed and James Porter. In June, 1838, under Bro. Reed's labors, J. P. Mann and Milo Carlton, now of Kansas, with many others, turned to the Lord. Bro. Moody and G. W. Lucy conducted a meeting which resulted in bringing in twenty-seven converts. M. L. Wilcox gave powerful support to the cause. All these brethren and others, especially the first named, watered the seed sown, and on that field many ripe sheaves have been reaped by the Lord of the harvest. Few churches have been more severely tried, yet it still keeps its light burning. Akron and Middlebury, 355; revived, 357. Alton, B., biography of, 300. Amend, Wm., conversion, 75; letter from, 79. Anecdote, 43, 108, 122, 169, 356, 360, 366, 368, 372, 380, 382. Akron and Middlebury, church, 355. Anthon, Prof., testimony of, 452. Applegate, John, biography of, 275. Association, Mahoning, 20; constitution and creed, 25; in Canfield, 34; in New Lisbon, 54; in Warren, 161; in Sharon, 270; in Austintown, 295; dissolved, 296. Atwater, D., 237, 238; biography, 242. Austintown, church arising, 127; organized, 132. Baptism, first in Cleveland by the Disciples, 419. Beardslee, J. O., biography, 398. Belief of the church in Wellsburg, 31. Benedict, J. D., 446, 467. Bentley, A., 19, 91; biography, 102. Birmingham, church, 465. Bloomfield, North, church, 300; reorganized, 304. Board of managers, Miss. Society, 397. Booth, Rev. Ezra, 250, 251, 252. Bristol, North, church, 466. Brockett, H., biography, 307; in Shalersville, 337. Burnet, D. S., 385, 448. Burns, A., 466, 467, 470. Campbell, Thos., biography, 41; visits the Western Reserve, 147; letter to Rigdon, 217. Campbell, A., messenger to the M. Association, 31; notable sermon, 35; biography, 45; visits the Western Reserve, 370; before the skeptics, 366, 371; eloquence described, 377; sermon in Bedford, 390; visits Youngstown, 449, 450. Call, Dana, 448, 467. Canfield, church, 120; established at the Center, 126. Chapman, S. S., 466. ib. Christian ministers of note, 80. Clapp, M. S., 193, 195; biography, 197. Cleveland, church arising, 415; organized, 420. Coleman, J. G., 232, 464, 470. Collins, Wm., 22, 215; biography, 225. Community system, urged by Rigdon, 298. Correspondence, Dr. E. Parmly and Prof. Anthon, 452. Creed of the M. Association, 27. DEATH OF PROMINENT MEN, 419. Deerfield, investigation society, 317; church formed, 319; Scott's visit, 320. Dine, Luther, 408, 409, 415. Discourses, 18, 35, 320, 366, 390. Discussions, Campbell and Walker, 18; Campbell and McCalla, 21; Campbell and Owen, 48; Campbell and Purcell, 48; Campbell and Rice, 48; Campbell and Skinner, 48; Wilcox and Graham, 356; Green and Davis, 385; Hartzel and Waldo, 385; Hartzel and Stedman, 449; Hartzel and Hayden, with Stedman and Locock, 439; Garfield and Denton, 441; Campbell and Underhill, 417. Dixon, Henry, 447, 448, 467. Eclectic Institute, origin and establishment, 260. Errett, Isaac, 101, 304, 440. Errett, J. W. 101, 228, 471. Evangelist call for, 55; Scott appointed, 58. Everest, H. W. 448, 470. Expectation of the millennium, 183. FAIRFIELD, EAST, CHURCH, 111. Finch, C. P., 317, 319, 323, 361. Foot, C. C., 338, 422, 443. GARFIELD, J. A., 222, 441. Gaston, James E., 86, 101, 118. Goodall, Eld. Warner, 191, 226. Gray, W. S., 360, 453. Green, A. B., sketch of, 363. Green, F. M. 345, 436. Hartzel, Jonas, experiences of, 313. Hawley, E. H., 259, 349. Hayden, William, chosen evangelist, 174; biography, 176. Hayden, Walter S., 228, 442, 453. Hayden brothers, William W., Warren L., and Morgan P., 323. Henry, John, 129; biography, 133. Hillock, Dr. T., 127, 283. Hinsdale, B. A., obituary sermon for S. Ryder, 245. Hubbard, E. B., sketch of, 311. James, J. W., 159, 471. Jones, Eld. Thos. G., 22, 91, 267. Jones, Alex. P., 196, 197, 215. Jones, J. H., 267, 392, 447. King, Dan. R., 228, 229. Leonard, Ezra, 123, 425, 467. Lessons of our forty years' experience, 454.
Letters, Campbell Thos., to Rigdon, 217; S. Ryder, 220; D. Atwater, 239; John Schaeffer, 324; Hayden to Campbell, 342; Dr. J. P. Robison, 395, 396. Lillie, W. A., 230, 466, 470. Lucy, G. W., 118, 304, 461. Mentor, great meeting by Bentley and Rigdon, 192. Middlebury and Akron, 355; renewed by sisters, 357. Middlebury, church, recent organization, 469. Millennium, expectation of, 183. Miller, Samuel, 207. Miller, Eld. Thos., 137, 120, 332. Minister's meetings, (Baptist), 38, 39, 93, 223. Mitchell, James, Nathan, David, 94. Moody, Wm., 430. Morgan, (Rock-Creek), church, 469. Moss, J. J., 196, 215, 410. NELSON, (Baptist), CHURCH, FORMED, 22, 237. Newburg, church, 402; reorganized, 405. Newcomb, Eld. Obadiah, 365, 367. New Lisbon, Association in, 55; the plea opened, 72. Newton Falls, church, 136, 139. Nickerson, Capt. J. G., 412, 420. Nickerson, Capt. D. P., 413, 420. Niles, church, 470. Norton, church, 470. Orange, North, church formed, 470. Orange, South, church in, 470. Origin and establishment of the Eclectic Institute, 260. Osborne, Jacob, biography of, 140. Palmyra, church organized, 332, 333. Perry, North, church arises, 346. Phillips, John T., 284, 467. Pinkerton, Dr. L. L., 423. Pompey Street, (Brunswick), church, 432. Pool, Dr. W. F., 360. Preachers' meetings, origin of, 405. QUARTERLY MEETING IN BRACEVILLE, 65. Quarterly Meeting in East Fairfield, 111. RAINES, AYLETT, and the Restorationists, 130; memories of Eld. T. Campbell, 149; biography, 150; trial, 166; ----- and Williams, 155. Report by Scott, evangelist, 171. Reeves, H., 119, 466, 471. Richardson, Dr. R., baptism of, 335. Rigdon, Sidney, 19, 209, 238. Rigdon, three brothers, Thomas, John, and Charles, 92. Robison, Dr. J. P., 229, 232, 294. Rudolph, Zeb, 237, 238, 260, 261. Ryder, Symonds, conversion, 238; biography, 245. SACKET, MYRON, 224. Salem, church, 116; re-established, 119. Schaeffer, John, experiences of, 324. Schooley, Wm., biography, 83, 125. Scofield, Edward, 22, 281, 424, 428. Scott, Walter, appointed evangelist, 58; biography, 61; among the churches, 65; begins in New Lisbon, 72; in Canfield, 120; in Austintown, 129; report to the association, 171. Sharon, Baptist church; 267; McCleery family, 267; church formed, 269; association in, 270. Sloan, R. R., 467, 472. 284. Smith, John T., 273. Stowe, church, 382; reorganized, 385. Streator, M. J., 146, 443. Thayer, Dr. I. A., 283, 466. Turney, A. S., 348, 467. UNION OF "CHRISTIANS" AND DISCIPLES, 125. Union of Christians illustrated, 162. Union of principles explained, 163. Wakefield, Edwin, 309, 467, 471. Warren, (Baptist), church, origin of, 91. West, Eld. Wm., 127, 128. Western Reserve, history and description, 13. White, H. J., 466, 469. White, R. G., 360, 466. Willard, Eld. S. R., 470. Wilcox, M. L., 356, 436, 471. Williams, E.; sketch of, 155; in Shalersville, 155; baptism of, 157; in Mentor, 195. Woodworth, Eld. Joshua, 127, 283. YEARLY MEETING SYSTEM, ORIGIN OF, 296. Yearly meeting, in Austintown, 296; in Randolph, 341; reported by Hayden, 342; in Wadsworth, 366; in Aurora, 379; in Newburg, 404; Euclid, 411, 414; in Bedford, 389; in Richfield, 429; in Youngstown, 450, 451.